"F1 2012" redirects here. For the video game based on the 2012 Formula One season, see F1 2012 (video game). Sebastian Vettel became a three-time World Champion with Red Bull Racing. The early season was tumultuous, with seven different drivers winning the first seven races of the championship; a record for the series. It was not until the European Grand Prix in June that a driver, Ferrari's Fernando Alonso, won his second race of the year, and with it, emerged as a championship contender. Alonso maintained his hold on the championship lead for the next seven races, taking his third win in Germany and finishing on the podium in the United Kingdom, Italy and Singapore. However, costly first-lap retirements in Belgium and Japan allowed his rivals to catch up, and defending World Champion Sebastian Vettel – like Alonso, a two-time title winner – took the lead in the sixteenth race of the season. Vettel, too, encountered difficulties throughout the season; contact with a backmarker left him to finish outside the points in Malaysia, while alternator failures at the European and Italian Grands Prix cost him valuable points and exclusion from qualifying in Abu Dhabi led him to start from the pit lane. Vettel entered the final race of the season with a thirteen-point lead over Alonso. Alonso needed a podium finish to stand any chance of becoming World Drivers' Champion, but in a race of attrition that finished under the safety car, Vettel finished in sixth place, scoring enough points to win his third consecutive championship, becoming just the third driver in the sport's sixty-three-year history to do so. In the World Constructors' Championship, Red Bull Racing secured their third consecutive title when Sebastian Vettel finished second at the United States Grand Prix. In addition to seeing seven different drivers win the first seven races, the 2012 season broke several records. The calendar for the season included twenty races, breaking the previous record of nineteen, which was first set in 2005. Six current or former World Drivers' Champions – Sebastian Vettel, Fernando Alonso, Jenson Button, Lewis Hamilton, Kimi Räikkönen, and Michael Schumacher – started the season, breaking the record of five established in 1970. The following twelve teams and twenty-five race drivers competed in the 2012 Formula One World Championship. The FIA published a provisional entry list on 30 November 2011, and the grid was finalised on 17 February. Teams competed with tyres supplied by Pirelli. Three teams changed their names for 2012: Team Lotus became known as Caterham (top); Renault was renamed as Lotus (middle); and Virgin Racing changed its name to Marussia (bottom). Lotus became known as Caterham, reflecting team principal Tony Fernandes's purchase of Caterham Cars. Renault changed its constructor name to Lotus after Lotus Cars expanded its title sponsorship program to include teams in Formula One and support series GP2 and GP3. Virgin became Marussia, following increased ownership of the team by Russian sports car manufacturer Marussia Motors. As a result of the name changes, Team Lotus and Lotus Renault GP declared that their ongoing dispute over the use of the Lotus name was over after they had reached an "amicable conclusion". Although the exact terms of the settlement were kept confidential, the joint statement detailed the transfer of the rights to the Lotus and Team Lotus names to Group Lotus's ownership. Williams announced that they would be using Renault engines for the 2012 and 2013 seasons, with an option to use Renault engines again in 2014 under the next generation of engine regulations. Renault had previously supplied engines to Williams from 1989 to 1997, when the team won four World Drivers' Championships and five World Constructors' Championships. Following their worst season in their thirty-year history – in which they finished ninth in the World Constructors' Championship with just five points – the team underwent a technical review, employing former McLaren designer Mike Coughlan (having served his suspension for his role in the 2007 Formula One espionage controversy) as Chief Designer, and promoting Jason Somerville to Head of Aerodynamics. Likewise, Marussia (then known as Virgin Racing) underwent a restructuring, splitting with Wirth Research mid-season after a technical review by Marussia Motors and the board of directors. The team also announced a technical partnership with McLaren that granted them access to McLaren's testing facilities as well as the purchase of Wirth Research facilities. In the week before the 2011 Indian Grand Prix, Force India announced that the Sahara Group had purchased a 42.5% stake in the team, valued at US$100 million. The investment gave the Sahara Group and team principal Vijay Mallya an equal stake in the team, with team director Michiel Mol controlling the remaining 15% of the team. Under the terms of the sale, the Sahara Group became Force India's naming-rights sponsor. Mercedes GP also changed the name of their team, announcing that they were to become known as Mercedes AMG. The new name originates from AMG, Mercedes-Benz's performance and luxury road car brand. HRT team principal Colin Kolles formally left his position, with the team citing the relocation of their headquarters to Spain as the reason for the separation. Former Minardi driver Luis Pérez-Sala took Kolles's place as team principal. In January 2012, the team relocated to a new facility in Valencia before settling at a permanent facility in Caja Mágica, Madrid. Peter Sauber formally stepped down from his position as team principal of Sauber F1 in the week before the Korean Grand Prix, appointing the team's CEO, Monisha Kaltenborn as his successor. Kaltenborn's appointment made her the first female team principal in the sport's sixty-three-year history. Romain Grosjean returned to Formula One with Lotus, the same team – then known as Renault F1 – that he made his debut with in 2009. The 2012 season saw several driver changes. Lotus chose not to take up an option on Vitaly Petrov's contract, and did not offer Bruno Senna a new contract. Petrov and Senna were replaced by 2007 World Drivers' Champion Kimi Räikkönen – returning to the sport after two seasons competing in the World Rally Championship – and reigning GP2 Series champion Romain Grosjean, who also returned to the sport after a two-year absence. Petrov later replaced Jarno Trulli at Caterham; Trulli's replacement meant that the opening race of the season would be the first race since the 1973 German Grand Prix to take place without an Italian driver on the grid. Senna joined Williams, the team having previously attempted to secure Räikkönen for the season. Senna replaced Rubens Barrichello, who left Formula One after a record-breaking nineteen seasons. He later moved to IndyCar for the 2012 season, joining KV Racing Technology. Like Räikkönen and Grosjean, Nico Hülkenberg also returned to Formula One, joining Force India alongside Paul di Resta. Adrian Sutil left the team, having spent six years with both Force India and its previous incarnations, Spyker and Midland. He initially sought a drive with Williams, before negotiations collapsed in December 2011. Sutil was later the subject of criminal action, charged with grievous bodily harm after allegedly assaulting a senior Renault team member with a glass in a Shanghai nightclub following the 2011 Chinese Grand Prix. Sutil was found guilty, and was sentenced to an eighteen-month suspended jail sentence and ordered to pay a €200,000 fine. Despite this, Sutil rejoined Force India for the 2013 season. Scuderia Toro Rosso did not retain Jaime Alguersuari or Sébastien Buemi, instead choosing to replace them with Daniel Ricciardo and 2011 Formula Renault 3.5 Series runner-up Jean-Éric Vergne. Ricciardo had previously served as the team's test and reserve driver before being placed at HRT for the 2011 British Grand Prix, while Vergne had completed a limited testing schedule for the team in the second half of the 2011 season. Sébastien Buemi became Red Bull Racing's testing and reserve driver contested the 24 Hours of Le Mans with Toyota, driving a TS030 Hybrid. Alguersuari was offered a seat at HRT, but turned it down and instead joined tyre supplier Pirelli as their test driver, developing tyre compounds for use in racing alongside former Virgin Racing driver Lucas di Grassi. Pedro de la Rosa and Narain Karthikeyan returned to Formula One with HRT. De la Rosa had been without a full-time drive since the 2010 Italian Grand Prix, having spent the majority of the 2011 season as a test driver for McLaren and making one appearance racing for Sauber; Karthikeyan was dropped by the team before the 2011 British Grand Prix in favour of Ricciardo. He, too, made a one-race appearance at the Indian Grand Prix, before leaving the team until the 2012 season began. Vitantonio Liuzzi, who drove for HRT in 2011, joined the Indian i1 Super Series. The series was later postponed until 2013, but Liuzzi was unable to retain his seat with the team. At the launch of the HRT F112 in March, Liuzzi was confirmed as one of the team's testing and reserve drivers alongside both former GP2 Series driver Dani Clos and Ma Qinghua, the first ever Chinese driver to step into a Formula 1 car. 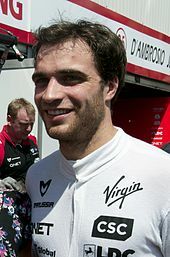 Jérôme d'Ambrosio left Marussia (then known as Virgin Racing) after the 2011 Brazilian Grand Prix. He later joined Lotus F1 as their third driver. Charles Pic – who placed fourth in the 2011 GP2 Series driving for Addax – joined Marussia, replacing d'Ambrosio. The season only saw one driver change, which was brought about when Lotus driver Romain Grosjean was found by race stewards to be responsible for causing a multi-car pile-up at the start of the Belgian Grand Prix. He was given a one-race ban and a €50,000 fine for his role in the collision, forcing him to miss the Italian Grand Prix. He was replaced by the team's testing and reserve driver, Jérôme d'Ambrosio. Grosjean returned to the team for the next round in Singapore. 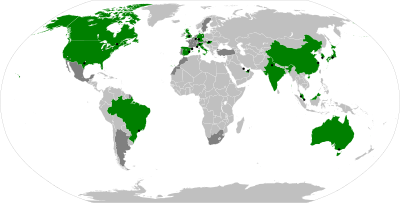 Nations hosting Formula One Grands Prix in 2012. Formula One returned to the United States in 2012, with the race held at the Circuit of the Americas near Austin, Texas. After the 2011 Bahrain Grand Prix was cancelled, the race was reinstated for the 2012 season with a provisional date in October. The final version of the calendar brought the race forward to April. The German Grand Prix returned to Hockenheim after the 2011 German Grand Prix was held at the Nürburgring, in line with the event's policy of alternating between venues. In May 2010, it was announced that Austin, Texas would host the return of the United States Grand Prix, the first since Indianapolis in 2007. Known as the Circuit of the Americas, the venue will be a brand-new, purpose-built permanent circuit designed by event promoter Tavo Hellmund and 1993 Grand Prix Motorcycle World Champion Kevin Schwantz with the assistance of German architect and circuit designer Hermann Tilke. In November 2011, Bernie Ecclestone expressed "minor" doubt over the race going ahead after what he described as "disagreements inside the [management] company" and gave the circuit owners and race organisers a deadline of 7 December – coinciding with the meeting of the FIA World Motorsports Council and the release of the final 2012 calendar – to sort out their differences or else risk losing the event entirely. The final calendar included the race, with Ecclestone confirming that a new arrangement had been made, and that the event organisers had paid their circuit sanctioning fees for 2012. The race was originally scheduled to be held in June, but was moved back to become the penultimate event of the season in response to concerns over the heat of the Texas summer and its effects on teams, drivers and spectators, and the failure of race organisers to meet a key deadline for the race sanctioning fees. The Turkish Grand Prix was removed from the calendar after Formula One Management and the event organisers could not agree on a renewed contract. In August 2011, organisers of the race revealed that they were negotiating with Bernie Ecclestone to resume their place on the calendar. However, the race was removed from the calendar later that month. The banning of exhaust-blown diffusers meant all teams had to redevelop the exit of the exhaust. The 2011 season saw teams running "off-throttle blown diffusers", which created downforce by forcing fuel through the engine to produce exhaust gases and directing it over the diffuser when the driver was not applying the throttle. This concept was originally banned in incremental phases, with increasingly restrictive rules on what teams could and could not do, with a full ban to be applied from the 2011 British Grand Prix onwards. However, the incremental ban was controversial, with several teams applying for and receiving permission to circumvent the total ban. After discussion between the FIA and engine manufacturers, the original regulations were restored, with the full ban delayed until 2012. The regulations in 2012 governed the design of the exhaust with the teams agreeing to strict constraints on the position of the exhaust tailpipe. This resulted in the exhaust exiting the bodywork much higher up than in 2011, and no longer in the vicinity of the diffuser. Several teams, including Williams and Mercedes used the Young Driver Tests in Abu Dhabi as an opportunity to test parts for the 2012 season in the face of the ban. In October 2011, a clarification to the amended rules was issued, effectively banning "exotic" engine maps; in November, further amendments were introduced, completely banning the practice of blowing exhaust gasses over parts of the car to improve downforce, following a bid by several teams to allow it under certain conditions. Further amendments were made in February 2012 when Mercedes alerted the FIA to a loophole in the regulations that would allow teams to continue using a partially blown diffuser. The FIA responded by re-writing the software governing the engine's Electronic Control Unit to close the loophole. At the German Grand Prix in July, Red Bull Racing were referred to race stewards after FIA Technical Delegate Jo Bauer noted that their engine maps had the potential to violate the technical regulations. Red Bull stood accused of manipulating the relationship between the torque produced by the Red Bull RB8 and the degree to which the throttle was open – particularly in medium-speed corners – thereby allowing more air to pass through the exhaust and over the diffuser, generating more downforce. Red Bull were cleared of wrongdoing, as, in the stewards' words, they had not technically broken any rules, but the FIA announced plans to rewrite the regulations governing throttle mapping so as to outlaw the practice entirely ahead of the Hungarian Grand Prix one week later. The rule changes required teams to submit an engine map used during one of the first four races of the season, which became known as the "reference map". Any subsequent changes to the throttle map would require the approval of the FIA, provided that the torque output above 6,000 rpm was within two percent of the output specified on the reference map. Further changes would be allowed at races with "exceptional atmospheric conditions", as designated by the FIA. In January 2012, the FIA banned the use of "reactive ride-height". The system, first proposed by Lotus in 2010 (but not applied until 2012), used hydraulic cylinders located in the brake calipers and suspension push-rods to make minute adjustments to the ride height of the car, thereby keeping the ride height at an optimal level throughout the race and providing stability during braking. The FIA initially approved the device as being legal, and several teams, including Ferrari and Williams, submitted plans to the FIA for their own versions of the device before it was banned one week later. The FIA later confirmed that the reactive ride-height systems violated Article 3.15 of the technical regulations, which states that "any aerodynamic effect created by the suspension should be incidental to its primary function" and "any device that influences the car's aerodynamics must remain immobile in relation to the sprung part of the car" and further noted that the system's primary purpose was achieving aerodynamic gains as opposed to providing stability under braking, and that the use of reactive ride-heights could also be challenged under Article 10.2 of the technical regulations, which govern suspension systems. The reduction in the height of the nose led to several teams using a "platypus" nose design, as seen in the Force India VJM05 (top). However, McLaren did not use this design, as evidenced in the McLaren MP4-27 (bottom). Technical regulations for 2012 include the reprofiling of the car's nose. The pre-2012 regulations allowed the nose to be as high as 62.5 centimetres (24.6 in) above ground, but the revisions to the sporting code lowered the maximum allowable height to 55 centimetres (22 in) 150mm ahead of the front bulkhead. This resulted in cars being launched with a "platypus" nose, as teams designed cars with a visible change in height along the nose assembly of the car. Mercedes AMG team principal Ross Brawn explained the distinctive nose shape as having come about from "several teams" wanting to use their 2011 chassis as the basis for their 2012 cars. Drivers were no longer permitted to have a "joker" gearbox change. Prior to 2012, drivers were entitled to change their gearboxes once over the course of the season without incurring a five-place grid penalty. This system was abandoned in 2012, with drivers only being allowed to change gearboxes once every five races. Starting in 2012, all cars were required to pass their mandatory FIA crash tests before being allowed to take part in pre-season testing. Previously, passing the crash tests was only a requirement prior to the first race of the season. Crash tests for the 2012 season will also be more rigorous than in previous years. At the meeting for the Formula One Commission in Geneva in November 2011, the use of helium in air guns used to change tyres during pit stops was banned. Despite increasing the rotation speed of the air guns by up to 30%, the practice of using helium was deemed to be too expensive to continue for the competitive gains it offered. At the 2012 Abu Dhabi Grand Prix, the FIA banned the use of "trick brake" devices, which used a bi-metallic strip that changed shape when heated by the brakes to open or close off braking ducts and improving braking efficiency under certain conditions. This was deemed to be in breach of Article 11.4 of the Sporting Regulations, which states that the only permissible changes to the braking system while a car is moving must be directly controlled by the driver. After being banned in 2009, in-season testing returned in 2012, with a test held at Mugello on 1 May ahead of the European leg of the 2012 championship. As teams were only be permitted to do fifteen days of testing over the course of the season, the pre-season winter testing schedule was cut back to accommodate the Mugello test. At the September 2011 meeting of the FIA World Motor Sport Council, representatives of the member organisations voted to amend the rules for double-waved yellow flags in all FIA-sanctioned championships. The amendment means that double-waved flags will be shown when a track marshal is working on or beside the circuit. Tyre supplier Pirelli revised their tyre compounds for the 2012 season in an effort to encourage teams to use each of the compounds supplied for individual races. Pirelli predicted that the changes would translate into 0.7 seconds' difference per lap between the harder and softer compounds, down from 1.5 seconds per lap in 2011. According to Pirelli, the hardest tyre compound available is just 31% harder than the softest compound on offer; by comparison, the hardest tyres used in 2011 were 70% harder than the softest. Faced with several constructors applying for name changes, teams requested a clearer definition of what constitutes a "constructor". Under the rules set out in the Sixth Concorde Agreement, several teams have been forced to compete under names that do not necessarily reflect their ownership – such as Sauber competing as "BMW Sauber" in 2010, despite BMW withdrawing from the sport at the end of the 2009 season – in order to preserve their status as a current constructor and their claim to a share of the television rights paid to teams that placed in the top ten in the final World Constructors' Championship standings. At the final meeting of the World Motorsports Commission in December 2011, a series of amendments to the sporting regulations were published. Chief among these is the re-introduction of a rule that will allow all lapped traffic under the safety car (which remained the Mercedes-Benz SLS AMG introduced in 2010) to be released from the queue before the car returns to pit lane, allowing the drivers to unlap themselves and to ensure a clean restart. Drivers were not permitted to leave the confines of the circuit without a justifiable reason, following a spate of incidents in 2011 when drivers were sighted using access roads around the circuit to shorten their reconnaissance and in-laps in order to preserve their fuel and tyres. Similarly, drivers will not be allowed to return to the normal racing line should they choose a defensive line going into a corner. Races were run to a maximum four-hour time limit to prevent the indefinite suspension of a race. This will stop the theoretical possibility of a race lasting more than eight hours. This rule was introduced in response to the rain-interrupted 2011 Canadian Grand Prix, which set a record for the longest race in Formula One history, at four hours, four minutes and thirty-nine seconds. Any driver in the pit lane when a race is suspended was permitted to return to the circuit and take up the position on the grid that they were running in at the time of the suspension. At the 2012 British Grand Prix in July, the FIA disabled the use of the Drag Reduction System (DRS) during a race while yellow flags were being shown in the same sector as the DRS zone. The move followed an incident at the European Grand Prix in which Michael Schumacher was observed to activate his DRS while yellow flags were being shown. In July 2011, a joint broadcasting deal for Formula One in the United Kingdom was announced between Sky Sports and the BBC. The announcement was controversial, being met with highly negative reactions from fans and observers as it had previously been believed that the terms of the Concorde Agreement prevented Formula One from being broadcast exclusively on pay-per-view, but the Agreement did not prevent a shared broadcast such as the proposal made by Sky Sports and the BBC. The controversial nature of the broadcast deal led to the Culture, Media and Sport Committee of the House of Commons calling Bernie Ecclestone and "senior BBC figures" including director-general Mark Thompson to answer questions over the details of the broadcasting arrangement. In December 2011, Red Bull Racing and Scuderia Ferrari exited FOTA, the Formula One Teams Association, following prolonged debate over the implementation of the controversial Resource Restriction Agreement, though Red Bull team principal Christian Horner reaffirmed his team's commitment to cost-cutting measures and highlighting the team's concerns over certain loopholes in the Resource Restriction Agreement that they felt teams and manufacturers would willingly exploit. One week later, Sauber also left the organisation, though the Swiss team did not publicly give a reason for ending their membership. In February 2012, Red Bull Racing's sister team Scuderia Toro Rosso was also reported as having left the organisation since the first schism in December. The 2012 season was preceded by three test sessions; one at Jerez de la Frontera and two in Barcelona. These sessions gave the teams and drivers the opportunity to familiarise themselves with their cars, though the teams downplayed the accuracy of testing times as being representative of the running order for the season. At the second test in Barcelona, Lotus F1 discovered a critical fault in the build of their chassis that forced them to miss four days of running, while both HRT and Marussia were unable to complete any mileage with their 2012 cars after both the HRT F112 and Marussia MR01 failed their crash tests, though both teams were able to complete shakedowns of their cars. "We are all terrified that somebody will unlock the secret and win everything. Unless, of course, that's us!" 2009 World Drivers' Champion Jenson Button on the competitive nature of the 2012 season. HRT failed to qualify for the Australian Grand Prix for the second consecutive year. The season began in Australia. Jenson Button took an early lead from pole-sitter Lewis Hamilton and the Red Bull cars while the rest of the field was bottle-necked by contact in the first corner. Button remained unchallenged throughout, even after a mid-race safety car to retrieve the stricken Caterham of Vitaly Petrov. Button went on to take his third victory at the Melbourne circuit, ahead of Sebastian Vettel, who profited from the safety car to pass Hamilton. McLaren team principal Martin Whitmarsh later admitted that Button was "more than marginal" on fuel after the team made a mistake in calculating their fuel loads for the race, forcing Button to use a "severe fuel-saving mode" from the eighth lap of the race. Hamilton came under threat from Mark Webber in the late stages of the race, but held on to secure third place. Webber finished fourth – his best result in his home Grand Prix – while Fernando Alonso finished fifth, having endured pressure from Pastor Maldonado for the last half of the race. Maldonado's race ended when he crossed onto the astroturf on the final lap and spun into the wall. Kimi Räikkönen finished seventh after a poor qualifying session saw him start the race seventeenth, taking advantage of a chaotic final lap to make up two places, while Felipe Massa and Bruno Senna both retired after a bizarre collision that saw their cars tangled up in one another. HRT failed to qualify for the race for the second consecutive season after drivers Pedro de la Rosa and Narain Karthikeyan failed to set a lap time within 107% of the fastest qualifying time. Fernando Alonso described driving the Ferrari F2012 as "like walking on a tightrope". Sergio Pérez took the first podium of his career in Malaysia. McLaren locked out the front row of the grid for the second race in succession, with Lewis Hamilton once again on pole. Both HRT cars qualified for the race, but filled out the final row of the grid almost two seconds behind Marussia's Charles Pic in twenty-second position. In the race, Hamilton made a better start than Jenson Button, but his lead was short-lived; heavy rain interrupted the race, forcing the suspension of the Grand Prix. When the race restarted an hour later, Button was involved in contact with Narain Karthikeyan that forced him to make an unscheduled stop for a new front wing, while Hamilton had a slow pit stop and was held in the lane while other cars passed. Fernando Alonso inherited the lead, with Sauber's Sergio Pérez a surprise second, having made an early stop for extreme wet weather tyres and then taking advantage of a rush to the pit lane to position himself in third at the restart. As the race wore on, Pérez began to quickly catch Alonso on a drying track. Daniel Ricciardo was the first driver to pit for dry-weather tyres on lap 38, triggering another round of stops. Sauber and Pérez initially looked as if they had left their stop too late when Pérez emerged from the pits five seconds behind Alonso, but he began catching the two-time World Champion at the same rate as he had before. Pérez closed to within half a second with seven laps to go, but ran wide at turn 14 and lost five seconds, later admitting that it was his mistake. He was unable to close the gap, and Alonso went on to win the race by two seconds, the win giving him a five-point lead in the championship. Pérez was second, taking his first podium and Sauber's best ever result as an independent team. Hamilton finished third ahead of Mark Webber and Kimi Räikkönen, while Button had to settle for fourteenth. Bruno Senna finished in sixth, scoring more points in a single race than his team scored in 2011. Sebastian Vettel finished outside the points after making contact with Karthikeyan and developing a puncture. The legality of the Mercedes F1 W03's rear wing was an ongoing issue early in the season. The championship resumed three weeks later in China, with the lead-in period to the race marked by Lotus F1 protesting the legality of Mercedes's rear wing design. The FIA rejected the protest, and with Mercedes allowed to continue racing with their car unchanged, Nico Rosberg took his – and the team's – first pole position since their return to Formula One in 2010, while a penalty to Lewis Hamilton for a gearbox change promoted Michael Schumacher to second on the grid. Schumacher would ultimately retire from the race after the first round of stops when it was discovered that one of his wheels had not been attached properly. Rosberg took an early lead in the race, and while his attempt to complete the race with only two pit stops came under threat from second-placed Jenson Button, a mistake by Button's pit crew during his final stop handed Rosberg a nineteen-second advantage over Kimi Räikkönen. Räikkönen was attempting a similar two-stop strategy, but his tyres wore out seven laps from the end of the race, and he lost eleven positions in a single lap. This forced Rosberg to drive conservatively to preserve his tyres while Button recovered from his disastrous pit stop to pass Sebastian Vettel for second. Button was held up by the incumbent World Champion long enough for Rosberg to preserve his tyres, and he became the 103rd person to win a Grand Prix. The result was also Mercedes's first win as a constructor since Juan Manuel Fangio won the 1955 Italian Grand Prix. Button was second, with Hamilton scoring his third consecutive third place, giving him a two-point championship lead over Button; Fernando Alonso, who had been leading the championship before the race, finished ninth. After two retirements in the opening rounds of the championship, Romain Grosjean scored his first points in Formula One by finishing sixth. The Bahrain Grand Prix was overshadowed by civilian protests against the ruling Al Khalifa family. In the face of ongoing media speculation and public pressure to cancel the race due to ongoing political instability in Bahrain, the FIA released a statement at the Chinese Grand Prix confirming that the Bahrain Grand Prix would go ahead as planned. The week preceding the Grand Prix saw a renewed wave of protests against the government's attempts use the race to "tell the outside world that the whole thing is back to normal", while human rights organisations including Amnesty International criticised the decision to hold the race amid the violent crackdowns. Three days before the race, a group of Force India mechanics travelling in an unmarked hire car were involved in a petrol bombing incident at an impromptu roadblock and were briefly exposed to tear gas fired by security forces. There were no injuries or damage, but two of the mechanics involved chose to leave the country. The team later announced their intentions to race despite the incident. Sebastian Vettel qualified on pole, his first since the 2011 Brazilian Grand Prix. Heikki Kovalainen qualified sixteenth, the second time Caterham (and its predecessor, Team Lotus) advanced beyond the first qualifying period in dry conditions. Vettel went on to win the race – becoming the fourth winner in as many races – after spending much of the race defending against Kimi Räikkönen. Having started eleventh, Räikkönen used an extra set of soft tyres to move up through the field. His team-mate, Romain Grosjean, finished third. Grosjean had initially shown the pace to challenge Vettel's lead, but unlike Räikkönen, he did not have an extra set of fresh tyres, and lost touch with the reigning World Champion after the first set of stops. Lewis Hamilton finished eighth, once again hampered by slow pit stops. He was later involved in an altercation with Nico Rosberg that saw Rosberg referred to the stewards for forcing Hamilton beyond the boundary of the circuit while defending his position, but he escaped without penalty. Hamilton went on to finish eighth, while team-mate Jenson Button was forced to retire two laps from the end of the race after reporting an unusual vibration from the differential. Daniel Ricciardo was involved in early contact that saw the Australian driver slide down the order from sixth at the start to fifteenth by the end of the race, having spent most of the Grand Prix caught behind Vitaly Petrov. Vettel's win gave him a four-point lead in the championship over Hamilton, while Mark Webber's fourth consecutive fourth place secured third overall. Red Bull Racing took the lead from McLaren in the World Constructors' Championship, while Lotus's double podium moved them into third overall. Sebastian Vettel won his first race of the 2012 season in Bahrain. The decision to hold the race despite the ongoing protests made it one of the most controversial Grands Prix in the sport's sixty-year history. Starting on 1 May, the teams conducted a three-day test at the Mugello Circuit in Italy ahead of the Spanish Grand Prix. The test gave teams the opportunity to assess major aerodynamic upgrades before racing them. HRT elected not to take part in the test, instead choosing to concentrate on establishing themselves at their new headquarters in Madrid. Both Lotus's trackside operations director Alan Permane and Red Bull Racing driver Mark Webber questioned the value of testing at the Mugello circuit as the characteristics of the circuit were unlike any of the circuits the championship was due to visit after the test, while Caterham driver Vitaly Petrov was critical of the choice of Mugello as a testing venue as he felt it was not safe enough for Formula One. Petrov's comments came shortly after Fernando Alonso crashed on the final morning of the test. Red Bull Racing and Lotus team principals Christian Horner and Éric Boullier were also critical of the test as they felt that the costs of conducting in-season testing outweighed any benefits, with Horner stating his opposition to continuing mid-season testing in the future. "We drive like on raw eggs and I don't want to stress the tires at all. Otherwise you just overdo it and you go nowhere." Michael Schumacher's criticism of tyre supplier Pirelli's 2012 tyre compounds. After Juan Pablo Montoya (top) won the 2004 Brazilian Grand Prix, Williams went eight years without a victory until Pastor Maldonado (bottom) won the 2012 Spanish Grand Prix. Following criticism over the sensitivity of their tyre compounds, tyre supplier Pirelli announced changes to their tyre allocation for the Spanish Grand Prix, making pit strategy the focal point of the Grand Prix. Pirelli would later diagnose the problems with the tyre compounds as originating from developing them on a testing chassis that was two years out-of-date at the time. Lewis Hamilton took his third pole of the season, edging out Williams driver Pastor Maldonado by half a second, while Maldonado's team-mate Bruno Senna was eliminated early when he spun. Hamilton was later excluded from the qualifying results after his car did not have enough fuel to return to the pits for scrutineering, promoting Maldonado to pole position and moving Hamilton to the back of the grid. Fernando Alonso took the lead of the race at the first corner, but Maldonado reclaimed it during the second round of pit stops, when his team forced Ferrari to pit early while Alonso was held up by the Marussia of Charles Pic. Maldonado maintained a lead of seven seconds over Alonso, but a mistake by his crew during the third pit stop cost him time and left him vulnerable to the Ferrari driver in the final stint of the race. Meanwhile, third-placed Kimi Räikkönen moved to an ambitious strategy that would see him attempt to force Maldonado and Alonso to race beyond the life expectancy of their tyres, allowing him to swoop in at the last minute to steal first place. Räikkönen's strategy failed as Maldonado withstood pressure from Alonso for fifteen laps, winning the race by three seconds and becoming the first Venezuelan driver to win a Formula One Grand Prix. 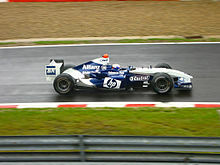 It was Williams's first win in one hundred and thirty Grand Prix starts; their previous race win was Juan Pablo Montoya's victory at the 2004 Brazilian Grand Prix. Lewis Hamilton recovered from twenty-fourth on the grid to finish eighth, while Sebastian Vettel overcame a drive-through penalty and an unscheduled stop for a technical fault that forced his team to replace his front wing to make a late move on Nico Rosberg for sixth place that would preserve his championship lead. For the second consecutive race, the fastest driver in qualifying did not start the race from pole. Michael Schumacher set the fastest time, but a five-place grid penalty left him sixth overall. Two hours before the race, protests against parts introduced onto the floor of the Red Bull RB8 left team principal Christian Horner with a choice: to change the offending parts and start both cars from the pit lane, guaranteeing that any result the team recorded would be preserved; or to leave the parts on the car, allowing both drivers to start the race from the positions they qualified in, but risking a post-race exclusion. Horner ultimately chose the latter option, and Mark Webber started from pole, establishing an early lead over Nico Rosberg as a first-corner accident eliminated four cars. The race was run under the constant threat of rain, with drivers trying to extend the life of their tyres to avoid being forced to make an additional stop and falling down the order. The rain never materialised, though Jean-Éric Vergne was observed using a set of intermediate tyres late in the race. The variety of strategies used by the front-runners resulted in the last ten laps being contested with the top six cars running nose-to-tail. Webber visibly faded in the final laps, but held on when the following cars were momentarily pinned behind the slow-moving Heikki Kovalainen. Webber won the race – his second on the streets of Monaco – with Rosberg second and Fernando Alonso third, the result giving Alonso a three-point lead in the championship. Red Bull Racing maintained their lead in the Constructors' Championship as rival teams chose not to follow through on the threat of their pre-race protest, while Kovalainen finished thirteenth to see Caterham overtake Marussia for tenth place. Elsewhere, Spanish Grand Prix winner Pastor Maldonado was given a ten-place grid penalty for an incident that saw him clip Sergio Pérez. Combined with a five-place penalty for changing his gearbox, Maldonado started from the back row of the grid where he was eliminated in the first-corner accident. "It really pisses me off, to be honest, because the car has passed every single technical regulation after the race. All of the teams that were against it did not make any protest after Monaco. The car passed the test after Bahrain, the car passed the test after Monaco, and now there has been a clarification on the rule. And the rule now is different. We had a car which was legal for the first part of the season. And now the rule has been changed and we'll start again." Mark Webber's response to claims he won the Monaco Grand Prix with an "illegal car". Lewis Hamilton became the seventh winner of the season when he won the Canadian Grand Prix. One week before the Canadian Grand Prix, the FIA declared the floor used by Red Bull in Monaco to be illegal, forcing the team to change the offending parts for the Canadian Grand Prix. Despite the ruling, the team's results were kept intact. The team was also forced to change the design of their axles, after FIA Race Director Charlie Whiting felt that holes in the axles contravened the technical regulations. Nevertheless, Sebastian Vettel comfortably took pole position by three-tenths of a second. Vettel controlled the early phase of the race, but was caught and passed by Lewis Hamilton before the first round of stops, while Fernando Alonso slipped through shortly afterwards. All three drivers were using a two-stop strategy at the time, but as Hamilton made his second stop, both Alonso and Vettel shifted to a one-stop strategy, with Alonso's team resorting to discussing strategy options in his native Spanish to prevent their rivals from overhearing their plans. Hamilton had twenty laps to make up a twelve-second deficit, and he easily reeled Vettel in; in response, Red Bull pitted the reigning World Champion, and Vettel fell to fifth. Hamilton's next target was Alonso, whose tyres lost all grip and he fell victim to Hamilton, Romain Grosjean, Sergio Pérez and Vettel in quick succession. Hamilton won the race, becoming the seventh winner in seven races and taking a two-point lead in the championship. Grosjean's second place saw Lotus take third place in the Constructors' Championship from Ferrari. Both Grosjean and Pérez expressed surprise at finishing on the podium, while 2011 winner Jenson Button finished sixteenth in what he described as his "worst race in years" and Michael Schumacher suffered a hydraulics failure that left his drag reduction system (DRS) device jammed in the open position. Fernando Alonso became the first man to win two races in 2012 at the European Grand Prix in Valencia, scoring his first home win since the 2006 Spanish Grand Prix. Starting eleventh, he was forced to navigate his way through traffic, narrowly avoiding early contact between Bruno Senna and Kamui Kobayashi as Sebastian Vettel broke free of the field to establish a twenty-second lead by the first round of stops. Vettel's lead was quashed when Heikki Kovalainen and Jean-Éric Vergne made contact, triggering the deployment of the safety car to clear debris from the circuit. Alonso found himself third at the restart and pounced on a mistake by second-placed Romain Grosjean to lead the chase against Vettel. Vettel pulled away once more, but his lead was short-lived as he lost drive and his engine shut down on lap 33. Grosjean attempted to challenge Alonso, but was forced out of the race with an alternator problem seven laps later, leaving Alonso in the lead, four seconds clear of Lewis Hamilton and Kimi Räikkönen. As the race entered the final laps, Räikkönen forced his way past Hamilton to secure second place, but Pastor Maldonado's attempts to take third place ended with Hamilton in the barrier and a broken nose for the Williams driver. Maldonado finished tenth, but was given a post-race drive-through penalty and was classified twelfth. Meanwhile, Michael Schumacher and Mark Webber had started to carve their way through the field by virtue of a late pit stop and easily picked off the minor points positions and taking advantage of the Maldonado—Hamilton collision to finish third and fourth behind Alonso and Räikkönen. It was Schumacher's first podium since the 2006 Chinese Grand Prix. Alonso's win cemented a twenty-point lead in the championship, whilst Vettel's retirement relegated him to fourth overall, twenty-six points behind Alonso. Heavy rain forced the suspension of qualifying for the British Grand Prix. Difficult conditions greeted the teams upon their arrival at the Silverstone Circuit, as parts of the Midlands received a month's rainfall in the space of two days. The torrential rain lasted throughout the weekend, forcing qualifying to be suspended for ninety minutes, before race day dawned clear. The circuit was declared dry, allowing the drivers to start on the tyre compound of their choice, with Alonso on the harder tyre streaking away at the start while Paul di Resta crashed at Aintree on the first lap after making contact with Romain Grosjean. As the leaders settled into a rhythm, Pastor Maldonado and Sergio Pérez collided at Brooklands, prompting an angry response from the Mexican driver. Perez's team mate Kamui Kobayashi also ran into trouble, locking his tyres as he entered his pit box and hitting three members of his pit crew, though none were seriously injured. The race was ultimately decided by the choice of tyre in the first stint as Alonso moved onto the softer option and Webber onto the harder prime for the final phase of the race. Webber caught Alonso with five laps to go, passing him on the Wellington Straight. Webber held on for his second win of the season, with Vettel third and Felipe Massa in fourth, his best result since achieving a podium in South Korea in 2010. The result meant Webber closed to within thirteen points of Alonso's championship lead, with both drivers breaking away from third-placed Vettel. After showing early promise in the wet conditions, McLaren went backwards in the dry, losing second place in the Constructors' Championship to Ferrari and third to Lotus. Reigning World Constructors' Champion Red Bull was involved in several technical disputes that challenged the legality of its car. Limited running in practice and a wet qualifying session meant that teams had to improvise their strategies at the Hockenheimring. Fernando Alonso controlled much of the race from pole position, only relinquishing the lead when he pitted, and he went on to take his third victory of the season. Lewis Hamilton's one hundredth Grand Prix started with a disaster when he picked up a puncture on the third lap and spent most of the race at the tail end of the field before retiring on lap 56 with a suspension problem. Confusion briefly reigned when Hamilton, in seventeenth place at the time, began lapping faster than the leaders and sought to unlap himself. Sebastian Vettel later claimed that this was a ploy by McLaren to force both him and Alonso to drive defensively against Hamilton, slowing them down enough to allow team-mate Jenson Button to leap-frog them at the second round of stops; Vettel lost a position to Button, but Alonso was unaffected, as Ferrari pitted him before Hamilton could interfere with his race. Button briefly looked as if he had the pace to pass Alonso for the race lead, but the race was deadlocked in the final twenty laps, and Button began to fade in the final five laps of the race. The race was marked by another technical dispute regarding Red Bull Racing, who were referred to the stewards by FIA Technical Delegate Jo Bauer for what he felt was an illegal engine map in use on the Red Bull RB8. The stewards elected to take no action against Red Bull, stating that the team had not violated any of the technical regulations, but noted that they did not accept all of the arguments presented by the team when asked to explain. The stewards were less forgiving of Vettel, who ran wide at the hairpin while trying to pass Button and could only complete the pass outside the limits of the circuit. Vettel had twenty seconds added to his race time as a penalty, demoting him to fifth overall. With Button promoted to second, Kimi Räikkönen inherited third place and Kamui Kobayashi was classified a career-best fourth. Following the mid-season break, Ferrari's Felipe Massa was in fourteenth place in the championship, 139 points behind team-mate and championship leader Fernando Alonso. As the championship moved into the second half of the season, Fernando Alonso maintained a thirty-four-point lead over his nearest rival, Mark Webber, with Sebastian Vettel a further ten points behind. Alonso's outlook for the race was dour, qualifying sixth and pinning his hopes on a wet race as Lewis Hamilton continued McLaren's mid-season resurgence, returning to pole position for the first time since the Malaysian Grand Prix. Following an aborted start triggered by Michael Schumacher lining up in the wrong grid position and then shutting his engine off in the confusion, Hamilton and Grosjean lead the field away. After prematurely moving Jenson Button onto a three-stop strategy, McLaren gave Hamilton the order to hold position as the tight confines of the Hungaroring circuit forced the teams to try to make up positions in the pits. This was evidenced by Kimi Räikkönen, who inherited the lead after the first set of stops and produced a series of fast laps that allowed him to rejoin in second, coming dangerously close to team-mate Grosjean under brakes as he emerged from the pit lane. Despite taking two seconds out of Hamilton's lead within five laps of rejoining the race, Räikkönen was powerless to reel Hamilton in any further. Hamilton won the race, the nineteenth of his career, with Räikkönen second and Grosjean in third. Hamilton's victory brought with it twenty-five points that put him back in championship contention, while a late decision by Red Bull to move Mark Webber onto a three-stop strategy saw the Australian slip further behind Fernando Alonso, as the Spaniard extended his championship lead to forty points. Lewis Hamilton's future was a source of ongoing speculation during the second half of the season, amid contract negotiations with McLaren and Mercedes. The championship resumed one month later in Belgium. Jenson Button qualified on pole and broke away at the start while a four-car pile-up started behind him when Romain Grosjean made contact with Lewis Hamilton and they both slammed into Fernando Alonso and Sergio Pérez, eliminating all four on the spot and triggering the safety car. Kamui Kobayashi's car was also damaged, and Pastor Maldonado was spun around amidst the chaos. Grosjean was later given a one-race ban for causing the collision, becoming the first driver in eighteen years to be banned from racing. Maldonado retired shortly after the restart with a broken front wing after making contact with Timo Glock, while Narain Karthikeyan spun off at Stavelot mid-way through the race when his wheel came loose. Button controlled the race from the front and was unchallenged throughout, while Sebastian Vettel clawed his way up to second from tenth on the grid. Kimi Räikkönen started and finished third, let down by a conservative pit strategy that forced him to make a second stop late in the race in order to use both compounds of tyre as per the rules – even when it became apparent that Button and Vettel were racing on a one-stop strategy – and Nico Hülkenberg finished in a career-best fourth place. Button's win allowed him to regain precious ground on the championship fight, while Alonso's retirement from the race and Vettel's second place moved the reigning World Champion to within twenty-four points of the championship lead. Scuderia Toro Rosso scored their first points since the Malaysian Grand Prix, with Jean-Éric Vergne and Daniel Ricciardo finishing eighth and ninth respectively. Further down the order, Caterham was summoned to the stewards on charges of an unsafe pit release when Heikki Kovalainen was released directly into the path of Karthikeyan and the team was given a €10,000 fine for the incident. "When you love racing this is very hard. I accept my mistake. We know that La Source is a very tough corner. [...] I did a mistake [sic] and I misjudged the gap with Lewis [Hamilton]. I was sure I was in front of him. So a small mistake made a big incident. I didn't change my line, I went from left to right. I was not really wanting to put anyone in the wall – I'm not here to stop the race in the first corner. I'm very, very sorry and I'm glad that nobody is hurt. But I have to say it is a very, very hard decision to hear." Romain Grosjean's response to being given a one-race ban for causing a multi-car pile-up at the start of the Belgian Grand Prix. Jérôme d'Ambrosio – seen here at the 2011 Monaco Grand Prix – replaced Romain Grosjean for the Italian Grand Prix. 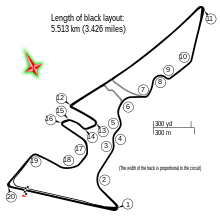 The final race in Europe took place at Monza. Ferrari's early bid to put Fernando Alonso on pole position by way of using Felipe Massa to offer him a slipstream ended in disaster when Alonso's rear anti-roll bar failed in the final period of qualifying, leaving the championship leader marooned in tenth while Lewis Hamilton took pole. Hamilton asserted early control over the race, and while Ferrari made significant ground early on to be running second and third – despite losing the data uplink between their cars and the pit wall that provided them with telemetry – it was Sergio Pérez who proved to be Hamilton's biggest challenge. Starting outside the top ten, Pérez elected to start on the harder compound tyres and complete one stop, producing fastest lap after fastest lap as McLaren's confidence was broken when Jenson Button's car was paralysed by a fuel pressure problem. Hamilton would ultimately prevail, but he was forced to push in the final few laps to maintain his lead, and won the race by four seconds as Pérez claimed his third podium of the season with second place. Alonso went on to finish third, benefiting from Button's retirement and a drive-through penalty for Sebastian Vettel when the reigning World Champion forced him so wide through the Curva Grande that Alonso was forced off the circuit. Bruno Senna later criticised the race stewards for not penalising Paul di Resta for a similar altercation on the approach to the Variante della Roggia early in the race. Meanwhile, with Romain Grosjean serving his suspension, Lotus enlisted former Marussia F1 driver Jérôme d'Ambrosio as their second driver for the weekend. He qualified sixteenth, and went on to finish thirteenth overall. Red Bull Racing suffered a double retirement, with Vettel falling victim to another alternator failure and Mark Webber spinning violently at the Ascari chicane, with the resultant damage to his tyres sending vibrations through the car that forced him to retire. This allowed Hamilton to leapfrog both drivers and Kimi Räikkönen – who finished the race fifth – to take second place in the World Drivers' Championship, with the result enabling McLaren to close the gap to Red Bull in the World Constructors' Championship. Paul di Resta finished in a career-best fourth place in Singapore. As the teams returned to Asia, the focus shifted to the championship race. Lewis Hamilton put himself in the ideal position to take the fight to Fernando Alonso, qualifying on pole whilst Alonso could only manage fifth place. In the physically most demanding race of the year, the teams jostled for position through the first phase of the Grand Prix, trying to position themselves for the final ten laps. Just as the drivers established a rhythm, Hamilton's gearbox failed, forcing him out of the race and handing the lead to Sebastian Vettel. The race was shortened by two laps to fit the two-hour time limit for a Grand Prix following a pair of lengthy safety car interventions; first, Narain Karthikeyan understeered into the barriers under the grandstands on lap 30, forcing the safety car to be deployed. The drivers had little opportunity to get comfortable on the restart, as Michael Schumacher misjudged his braking point at the end of the Esplanade Bridge, careening into the back of Jean-Éric Vergne and triggering the safety car for the second time in an accident that was a near mirror-image of his collision with Sergio Pérez in 2011. He was later given a ten-place grid penalty for the Japanese Grand Prix. Vettel controlled the race from the second restart, beating Jenson Button to the line, for his second win of the season and his first since the Bahrain Grand Prix five months previously. Alonso completed the podium, retaining his championship lead after defending from Paul di Resta late in the race. Elsewhere, a string of retirements – including a late engine problem for Bruno Senna, which left the Brazilian with minor burns to his back – and a series of altercations involving Mark Webber, Nico Hülkenberg, Kamui Kobayashi and Sergio Pérez as they fought over the minor points positions allowed Timo Glock to finish twelfth, the result seeing Marussia retake tenth position in the World Constructors' Championship from Caterham. Romain Grosjean (left) was criticised for his role in causing another first-lap incident, this time spinning Mark Webber around at the start of the race. Fernando Alonso's luck finally ran out in Japan; having spent most of the season profiting from poor results from his rivals when he needed them the most, Alonso was the victim of a dramatic first corner clash, spinning out when he made contact with Kimi Räikkönen and paving the way for his championship rivals to make considerable inroads into his twenty-nine-point championship lead. Mark Webber was also caught up in the opening lap melee when he was hit by Romain Grosjean; Webber was forced to pit straight away, while Grosjean was given a ten-second stop-go penalty for causing yet another first lap incident. Bruno Senna also ran afoul of the stewards, hitting Nico Rosberg whilst trying to avoid Grosjean and Webber and earning a drive-through penalty for his troubles while Rosberg retired on the spot. Sergio Pérez added his name to the growing list of early retirements when he slid off at the hairpin under brakes and into the gravel trap whilst trying to force his way past a struggling Lewis Hamilton. Sebastian Vettel won the race from pole position, having led every lap of the race and setting the fastest lap time in the process to complete his second Grand Chelem. Felipe Massa finished second, his first podium result since the 2010 Korean Grand Prix, whilst Kamui Kobayashi claimed the first podium of his career – and the first podium for a Japanese driver at the Suzuka Circuit since Aguri Suzuki finished third in 1990 – after withstanding late pressure from Jenson Button. With Alonso retiring and Vettel taking a full twenty-five points for victory, the championship fight became as close as it had been all season long. "It's five races to go, it will be like a mini championship, because we start with the same points and we need to score one more point [than Vettel] in five races. So we will try to do it." Championship leader Fernando Alonso when asked how he will win the World Drivers' Championship after Sebastian Vettel cut his lead to just four points after the Japanese Grand Prix. Sebastian Vettel's momentum continued one week later in Korea, winning his third consecutive race and taking a six-point championship lead as Fernando Alonso finished third. Vettel overcame pole-sitter Mark Webber at the start, and was aided in building up a lead by first-lap contact between Jenson Button, Nico Rosberg and Kamui Kobayashi that saw Button and Rosberg retire with damage from the collision; Rosberg pulled over on the approach to the third turn, forcing a protracted yellow flag period as marshalls attempted to retrieve his car. With the sporting regulations banning overtaking while yellow flags were shown, the field was effectively thinned out in the opening laps as drivers were unable to pass one another. Tyre management became the focus of the race, as drivers reported heavy graining, particularly on the right-front tyre, which bore most of the load over a lap of the circuit. Vettel ignored six radio calls from his pit wall cautioning him that a tyre failure was imminent, only backing off just enough in the final few laps to secure victory over Webber by six seconds. The team later denied that there had ever been a problem with Vettel's tyres. Further down the order, Scuderia Toro Rosso's Jean-Éric Vergne and Daniel Ricciardo fought their way from sixteenth and twenty-first on the grid to finish eighth and ninth, while Romain Grosjean drove a conservative race to finish seventh, having been warned beforehand by the stewards that another first-lap altercation would likely result in his disqualification from the race. Lewis Hamilton's day went from bad to worse when an anti-roll bar on his McLaren failed, while the car handled its tyres so poorly that he was forced to make an unscheduled stop in order to make it to the finish, only to tear up a length of astroturf that wreaked havoc on his downforce and he slid down to tenth place, narrowly fending off an opportunistic charge from Sergio Pérez to take the final World Championship point on offer. Button's retirement and Hamilton's single point meant that McLaren lost second place in the World Constructors' Championship to Ferrari, and Hamilton admitted that his bid to be the 2012 World Drivers' Champion was over. Ferrari's strategy for staying in the championship battle saw them introduce upgrades to the F2012 at every remaining race in the season, starting with an extensive revision for the Indian Grand Prix, but whatever advantage they offered was still not enough for Fernando Alonso to catch Sebastian Vettel. Vettel dominated the weekend, setting the fastest time in every practice session before qualifying on pole, and leading every lap of the sixty-lap race, though he was denied his third Grand Chelem when Jenson Button set the fastest lap of the race on the final lap. Fernando Alonso finished second, conceding another seven championship points to Vettel. The Ferrari driver rounded up both McLaren drivers at the start of the race and proceeded to chase down Mark Webber for second, only overtaking the Australian on the long back straight when his car developed a KERS fault fifteen laps from the end that it never recovered from. Webber held off a late challenge from Lewis Hamilton to complete the podium. Further down the order, Kimi Räikkönen finished seventh after spending most of the race trapped behind Felipe Massa, and later claimed that mistakes on Saturday had robbed him of a podium on Sunday, while Pedro de la Rosa retired from the race when he suffered a brake failure that saw him spin into the barriers at Turn 4. The race was marked by a series of explosive punctures after cars made light contact with one another; Michael Schumacher's right-rear tyre deflated on the first lap when he made contact with Jean-Éric Vergne at the first corner; Sergio Pérez suffered a puncture under similar circumstances when he glanced Daniel Ricciardo's front wing, with the loose rubber damaging the floor of Pérez's car enough that he was forced into retirement; and Pastor Maldonado also had a tyre punctured when he and Kamui Kobayashi touched at speed on the approach to Turn 5, forcing the Venezuelan to run wide onto the tarmac run-off, but suffering no lasting damage. Kimi Räikkönen took Lotus's first victory of the 2012 season in Abu Dhabi after he inherited the lead following Lewis Hamilton's retirement from the race. Sebastian Vettel's dominant run was derailed in Abu Dhabi when his car was found to have insufficient fuel after qualifying and he was subsequently moved to the back of the grid. As Lewis Hamilton led the race away from the start, Vettel started from pit lane and took advantage of a chaotic opening corner that saw Nico Hülkenberg, Paul di Resta, Romain Grosjean and Bruno Senna tangle; Hülkenberg was forced out, while di Resta and Grosjean pitted with damage. Vettel began to round up the HRTs, Marussias and Caterhams, but his early progress came at the expense of his front wing endplate when he made contact with Senna at Turn 8 switchback. He chose not to pit for the time being, as the race was interrupted by the intervention of the safety car. Nico Rosberg, who had been forced to pit with damage to his front wing, was in the process of overtaking Narain Karthikeyan as Karthikeyan's car began to fail and the Indian quickly slowed. Rosberg, caught unawares by Karthikeyan's troubles, was launched over the back of the HRT and into the barrier. During the safety car period, Vettel was forced to pit when he swerved to avoid Daniel Ricciardo and crashed into the polystyrene bollard marking the start of the DRS zone, further damaging his wing. Red Bull Racing took the opportunity to pit him early, with the downside being that Vettel would have to do 42 laps on the soft tyre when supplier Pirelli predicted they could only do 36. Meanwhile, Hamilton suffered another mechanical failure while leading the race, and was once again forced out, handing the lead to Kimi Räikkönen while Fernando Alonso inherited second. Vettel began to work his way through the field again, but was forced to make a second stop when his tyres started losing grip. He was saved by the second appearance of the safety car moments later, brought about when di Resta forced Sergio Pérez wide; as Pérez rejoined the circuit, he cut back across the front of Grosjean and the two made contact, which in turn forced Grosjean into the path of Mark Webber. Grosjean and Webber retired, whilst Pérez was given a stop-go penalty. When racing resumed, Räikkönen began to rebuild his lead over Alonso, who was being harried by Jenson Button; Button himself was being harried by Vettel in fourth. Button and Vettel's duel allowed Alonso to break free, and he started chasing down Räikkönen in the last five laps. Räikkönen held on to secure his – and Lotus F1's – first victory of the season. Alonso was second, while Vettel caught and passed Button to complete the podium, keeping a ten-point championship lead in the process. With both Alonso and Vettel finishing on the podium with him, Räikkönen's win was not enough to keep him in contention for the World Drivers' Championship, leaving the title to be fought out between Alonso and Vettel over the final two races of the season. Despite its troubled construction period, the Circuit of the Americas passed its final FIA inspection on 25 September, allowing the race to go ahead. Sebastian Vettel took his sixth pole position of the season, whilst Alonso struggled throughout qualifying to start the race ninth, which became eighth when Romain Grosjean received a grid penalty for an unscheduled gearbox change. Amid concerns that drivers starting from even-numbered grid slots would suffer from a lack of grip as they were located off the racing line, Ferrari deliberately broke the seal on Felipe Massa's gearbox, thereby giving him a five-place grid penalty and promoting Alonso to seventh and the clean side of the grid. Ferrari's fears were not without merit as the drivers starting from even-number spaces fell behind at the start of the race. Vettel quickly converted pole position into a steady race lead as Lewis Hamilton fought to regain second place from Mark Webber. Moments after Hamilton caught him on lap 17, the Australian suffered yet another alternator problem, and coasted to a halt. Red Bull Racing team principal Christian Horner later admitted that the team's perpetual alternator problems were a serious concern with just one race left in the championship, a World Championship at stake and very little time to diagnose and correct the problem. With Webber now out of the running, Hamilton then turned his attentions on Vettel and steadily closed the gap to the lead, overtaking the World Championship leader on lap 42 when Vettel got caught behind Narain Karthikeyan in the meandering first sector, which allowed Hamilton to pass Vettel along the long back straight. Hamilton held onto the lead for the final fourteen laps, but with Vettel never more than a second and a half behind him, Hamilton could not afford to relax, and he won the race by just six-tenths of a second. Alonso recovered from seventh to finish third – marking the first time that he, Hamilton and Vettel had stood on the podium together in the one hundred races all three had contested together – and forcing the title fight to extend to the final round in Brazil. Further down the order, Massa overcame his gearbox penalty to finish fourth, while Jenson Button fell from twelfth on the grid to sixteenth at the end of the first lap, using an alternative strategy to claw his way back up to fifth. Michael Schumacher, on the other hand, went backwards; after qualifying fifth, his Mercedes chewed through its tyres, forcing him to make a second stop that sent him plummeting down the order to finish sixteenth, and a clutch problem during his stop deprived Kimi Räikkönen of the chance to compete with Alonso for the final podium place. Both Marussia drivers out-qualified the Caterhams for the first time, only for Timo Glock and Charles Pic be out-raced by Heikki Kovalainen and Vitaly Petrov, but the Russian team held onto tenth place in the World Constructors' Championship. Despite losing Webber to an alternator failure, Red Bull collected enough points to secure their third consecutive World Constructors' Championship title. Lewis Hamilton retiring from the Brazilian Grand Prix. The final race of the season was run in conditions that were never quite wet enough for drivers to use wet tyres, but never quite dry enough for slick tyres to provide enough grip. While Jenson Button and Lewis Hamilton fought over the race lead, Sebastian Vettel was involved in a first-lap clash with Bruno Senna that damaged his exhaust and spun him around, relegating him to last place. Senna retired on the spot, as did Sergio Pérez, who was caught in the crossfire. The race was one of attrition, with Pastor Maldonado and Romain Grosjean also crashing out early. Button seized the lead from Hamilton, but soon found himself under pressure from Nico Hülkenberg and lost the lead to the German driver on lap 18, and second place to Hamilton shortly thereafter. The field stabilised themselves after the first round of stops, with Vettel in the lower points and Fernando Alonso running fourth when he needed a podium to stand any chance of being champion. Hülkenberg spun on lap 48 and lost the lead to Hamilton, but caught the McLaren on lap 54 as they encountered lapped traffic. The two made contact in the first corner, forcing Hamilton out of the race and earning Hülkenberg a drive-through penalty for causing an avoidable accident. In the wake of their collision, Button re-took the lead and held on to the end of the race. Meanwhile, the rain intensified, prompting teams to scramble for tyres. Hülkenberg's penalty and Hamilton's retirement promoted Alonso to the podium, which became second place when team-mate Felipe Massa yielded for him. A slow stop for Vettel relegated him to twelfth and swinging the balance of power in Alonso's favour. In the last ten laps of the race, Vettel began to make his way back up the order until he was seventh, just enough to secure the title, but leaving him vulnerable if the damage he received on the first lap – which by now had left a long crack running along the floor of his car – got worse. Vettel's seventh became sixth when Michael Schumacher moved aside to let Vettel through. Two laps from the end of the race, Paul di Resta crashed heavily as he came onto the main straight, forcing the deployment of the safety car. Button won the race, with Alonso second and Massa third, but Vettel's sixth place was enough to secure his third consecutive World Drivers' Championship. Kimi Räikkönen finished the season third overall, having benefited from Hamilton's retirement to hold onto the place following a bizarre incident in which he left the circuit and attempted to rejoin by taking to the support paddock pit lane, only to find the way blocked and forcing him to double back and find another way onto the circuit. In his final race in Formula One, Schumacher's seventh place saw him finish the season in thirteenth place overall; his worst performance over a season since he contested six rounds during the 1991 season. In the World Constructors' Championship, Ferrari secured second place from McLaren with two cars on the podium, while Kamui Kobayashi's ninth place was not enough for Sauber to take fifth from Mercedes, and Marussia lost tenth place to Caterham when Vitaly Petrov secured the team's best result of the season with eleventh place. Nikolai Fomenko, Marussia's director of engineering, later claimed that Charles Pic had deliberately let Petrov through, as Pic had announced his move to Caterham for the 2013 season two days before the race; however, no action was taken by the FIA in response to these claims. Three days after the Brazilian Grand Prix, reports began to surface suggesting that Sebastian Vettel's championship was under threat and that Ferrari would be filing a formal protest against the race results. The challenge centred on a pass Vettel made on Jean-Éric Vergne early in the race. At the time, the first sector of the circuit was under yellow flag conditions following the spin and retirement of Pastor Maldonado at Curva do Sol, the Interlagos circuit's third corner, which feeds onto the back straight. Vettel overtook Vergne along the straight, which led to claims that the pass was illegal because of the yellow flags. Intense media speculation suggested that the challenge threatened Vettel's championship because as the race finished behind the safety car, any post-race penalty had the potential to demote him in the race standings, and Vettel would not have enough points to secure the title. Ferrari wrote to the FIA, requesting clarification on the matter. The FIA reviewed the incident and declared that Vettel's pass was legal as a green flag was being shown by a marshal adjacent to the pit exit, meaning the track was green from that point onward; the confusion had been caused by a digital board showing a yellow flag on the exit of Curva do Sol some one hundred metres before the marshalling post. Both Ferrari and Red Bull Racing announced that they were satisfied with the ruling, thereby preserving Vettel's championship. Official FIA results for the Constructors' Championship identified the constructors as "Red Bull Racing", "Scuderia Ferrari", "Vodafone McLaren Mercedes", etc. ^ Lewis Hamilton was excluded from pole position at the Spanish Grand Prix for a technical infringement and moved to the back of the grid. Pastor Maldonado was recognised as the pole-sitter for the race. ^ Michael Schumacher recorded the fastest time in qualifying for the Monaco Grand Prix, but started sixth after a five-place grid penalty from the previous race was applied. Mark Webber was recognised as the pole-sitter for the race. ^ a b Noble, Jonathan (9 June 2011). "Bahrain gives up on 2011 race". Autosport. Haymarket Publications. Retrieved 6 March 2012. ^ Vermeeren, Frances (29 November 2011). "Comeback Räikkönen: a record number of champions". GP Now. Archived from the original on 6 September 2012. Retrieved 29 May 2012. ^ Holt, Sarah (16 October 2011). "Sebastian Vettel wins Korean Grand Prix from Lewis Hamilton". BBC Sport. Retrieved 28 December 2011. ^ a b Collantine, Keith (18 November 2012). "Red Bull win third constructors' title in a row". F1 Fanatic. Keith Collantine. Retrieved 18 November 2012. ^ "2012 Formula 1 Teams and Drivers". Formula 1.com. Formula One Management. 20 March 2012. Archived from the original on 22 March 2012. Retrieved 20 March 2012. ^ "2012 FIA Formula One World Championship Entry List". Fédération Internationale de l'Automobile. 30 November 2011. Archived from the original on 17 November 2012. Retrieved 31 January 2014. ^ a b c "Vitaly Petrov Joins Caterham F1 Team". Caterham F1. 17 February 2012. Archived from the original on 7 August 2012. Retrieved 17 February 2012. ^ Beer, Matt (14 March 2011). "Horner pleased to end Vettel rumours". Autosport. Haymarket Publications. Retrieved 14 March 2011. ^ "Webber Signs With Red Bull For 2012". Red Bull Racing. 27 August 2011. Archived from the original on 10 November 2011. Retrieved 27 August 2011. ^ Elizalde, Pablo (5 October 2011). "Button secures new multi-year contract at McLaren". Autosport. Haymarket Publications. Retrieved 5 October 2011. ^ "Schumacher could stay in F1 after 2012". Espnf1.com. 27 January 2010. Retrieved 25 July 2010. ^ "Rosberg extends Mercedes contract". EspnF1.con. ESPN. 10 November 2011. Retrieved 10 November 2011. 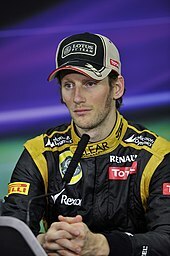 ^ a b c d "Romain Grosjean joins Kimi Raikkonen at Lotus Renault for 2012". Autosport. Haymarket Publications. 9 December 2011. Retrieved 9 December 2011. ^ a b c d Monza, Keith (4 September 2012). "Jerome d'Ambrosio to stand in for Grosjean at Monza". F1 Fanatic. Keith Collantine. Retrieved 4 September 2012. 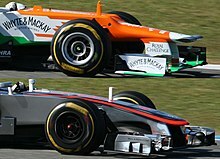 ^ a b c d "Hulkenberg joins Di Resta in Force India's 2012 line-up". Formula One Administration. 16 December 2011. Archived from the original on 5 January 2012. Retrieved 16 December 2011. ^ "Jules Bianchi joins Sahara Force India as reserve driver for 2012". Force India. 27 January 2012. Archived from the original on 5 February 2012. Retrieved 27 January 2012. ^ a b c "Kobayashi and Perez to stay at Sauber in 2012". Formula One World Championship. 28 July 2011. Archived from the original on 16 October 2011. Retrieved 28 July 2011. ^ a b c "Ricciardo earns Toro Rosso ride". The Australian. News Limited. Agence France-Presse. 15 December 2011. Retrieved 15 December 2011. ^ a b "Pastor Maldonado Confirmed for 2012 with Valtteri Bottas as Reserve Driver". Williams F1. 1 December 2011. Archived from the original on 3 December 2011. Retrieved 1 December 2011. ^ a b Elizalde, Pablo (17 January 2012). "Williams confirms Bruno Senna will race for the team in F1 in 2012". Autosport. Haymarket Publications. Retrieved 17 January 2012. ^ "Pit & Paddock: Third year for Trulli and Kovalainen". Autosport. Vol. 205 no. 11. Haymarket Publications. 15 September 2011. p. 12. Heikki Kovalainen and Jarno Trulli will continue to drive for Team Lotus next season. Trulli was, as expected, officially announced as a 2012 driver by the team last weekend, while team boss Tony Fernandes confirmed to Autosport that Kovalainen will also be staying on. ^ "Caterham signs Giedo van der Garde as reserve driver". Autosport. Haymarket Publications. 4 February 2012. Retrieved 4 February 2012. ^ "Alexander Rossi confirmed as Caterham F1 Team Test Driver". Caterham F1. 9 March 2012. Archived from the original on 29 October 2013. Retrieved 9 March 2012. ^ a b Beer, Matt (21 November 2011). "Pedro de la Rosa signs for HRT from 2012". Autosport. Haymarket Publications. Retrieved 21 November 2011. ^ a b "Dani Clos joins HRT F1 Team as its new test driver for 2012". HRT F1. 13 February 2012. Archived from the original on 7 November 2012. Retrieved 13 February 2012. ^ Strang, Simon (24 July 2011). "Timo Glock has re-signed with Virgin on a new three-year deal". Autosport. Haymarket Publications. Retrieved 24 July 2011. ^ "Standing By". Marussia F1. 20 September 2012. Archived from the original on 7 October 2012. Retrieved 20 September 2012. We are very happy to announce that rising star, Max Chilton, has been elevated from our Young Driver Programme to the position of Formula 1 Reserve Driver with effect from the 2012 Japanese Grand Prix next month and for the rest of the current F1 season. ^ a b c "Marussia Virgin Racing Completes 2012 Race Driver Line-up". Virgin Racing. 27 November 2011. Archived from the original on 29 November 2011. Retrieved 27 November 2011. ^ a b Cooper, Adam (3 November 2011). "Caterham, Lotus and Marussia name changes approved". Adam Cooper's F1 Blog. WordPress. Retrieved 4 November 2011. ^ Noble, Jonathan (3 November 2011). "Formula 1 chiefs approve name changes for Lotus, Renault and Virgin". Autosport. Haymarket Publications. Retrieved 4 November 2011. ^ "Tony Fernandes buys Caterham". en.espnf1.com. 2011. Retrieved 25 March 2012. ^ "Team Lotus confirms Caterham takeover". AUSmotive.com. 2011. Retrieved 25 March 2012. ^ "Lotus ART becomes Lotus GP in 2012". GP2 Series. GP2 Motorsport Limited. 10 January 2012. Archived from the original on 18 January 2012. Retrieved 8 February 2012. ^ Noble, Jonathan (11 November 2010). "Russian car maker takes stake in Virgin". Autosport. Haymarket Publications. Retrieved 25 March 2012. ^ Holt, Sarah (11 November 2010). "Russian supercar firm Marussia takes over Virgin Racing". Yas Marina Circuit, Abu Dhabi: BBC Sport. Retrieved 25 March 2012. ^ "Group Lotus Plc and Proton Holdings Berhad, 1Malaysia Racing Team, Caterham Cars and Tony Fernandes". 9 November 2011. Retrieved 9 November 2011. ^ Collantine, Keith (9 November 2011). "Lotus confirms 2012 name change to Caterham". F1 Fanatic. Keith Collantine. Retrieved 9 November 2011. ^ Beer, Matt (4 July 2011). "Williams to run Renault engines again from 2012". Autosport. Haymarket Publications. Retrieved 4 July 2011. ^ Collantine, Keith (9 December 2011). "Williams fall into F1's vicious cycle". F1 Fanatic. Keith Collantine. Retrieved 3 February 2012. ^ Collantine, Keith (28 June 2011). "Williams appoints new technical staff for 2012 car". F1 Fanatic. Keith Collantine. Retrieved 3 February 2012. ^ "Virgin to break ties with technical partners Wirth". Formula One Association. 2 February 2011. Archived from the original on 29 June 2011. Retrieved 25 August 2011. ^ Noble, Jonathan (4 July 2011). "Virgin enters into technical partnership with McLaren". Autosport. Haymarket Publications. Archived from the original on 17 July 2011. Retrieved 25 August 2011. ^ "Sahara India Pariwar announces co-ownership of the Force India Formula One Team with Dr. Vijay Mallya". Force India. 12 October 2011. Archived from the original on 10 November 2011. Retrieved 12 October 2011. ^ "Silver Arrows works team to race as Mercedes AMG Petronas Formula One Team". Mercedes AMG Petronas Formula One Team. 5 December 2011. Retrieved 19 April 2013. ^ Collantine, Keith (14 December 2011). "Colin Kolles leaves HRT". F1 Fanatic. Keith Collantine. Retrieved 14 December 2011. ^ Collantine, Keith (15 December 2011). "Perez-Sala takes over as HRT team principal". F1 Fanatic. Keith Collantine. Retrieved 15 December 2011. ^ Saward, Joe (11 January 2012). "Meanwhile in Valencia". Joe Saward Blogs About the World of F1. WordPress. Retrieved 12 January 2012. ^ a b Elizalde, Pablo (25 April 2012). "HRT will not attend Mugello test". Autosport. Haymarket Publications. Retrieved 26 April 2012. ^ Collantine, Keith (11 October 2012). "Kaltenborn to take over as Sauber team principal". F1 Fanatic. Keith Collantine. Retrieved 11 October 2012. ^ "Petrov confirmed at Renault until 2012". Formula One Administration. 22 December 2010. Archived from the original on 11 July 2011. Retrieved 28 July 2011. ^ "Raikkonen poised to return to F1 with Williams- James Allen on F1 – The official website". Jamesallenonf1.com. Retrieved 5 November 2011. ^ "Kimi and Williams F1". Joesaward.wordpress.com. 23 September 2011. Retrieved 5 November 2011. ^ Collantine, Keith (1 March 2012). "Rubens Barrichello confirms move to IndyCar". F1 Fanatic. Keith Collantine. Retrieved 2 March 2012. ^ "Sutil unsurprised by Senna deal". SkySports.com. BSkyB. 19 January 2012. Archived from the original on 21 January 2012. Retrieved 19 January 2012. ^ "Adrian Sutil Charged with Causing Grievous Bodily Harm". F1 Orbit. Motorsport.com. 12 January 2012. Archived from the original on 15 January 2012. Retrieved 12 January 2012. ^ "Sutil zu Bewährungsstrafe verurteilt" [Sutil was sentenced to probation] (in German). Sport1.de. 31 January 2012. Archived from the original on 21 July 2012. Retrieved 31 January 2012. ^ "Buemi eying 2013 F1 race seat". Hindustan Times. HT Media. 7 January 2012. Archived from the original on 8 January 2012. Retrieved 8 January 2012. ^ "Toyota recruits Anthony Davidson, Sebastien Buemi for second TS030 HYBRID". Autosport. Haymarket Publications. 10 February 2012. Retrieved 17 February 2012. ^ "Alguersuari 'says no' to HRT". Sky Sports. British Sky Broadcasting. 8 January 2012. Archived from the original on 11 January 2012. Retrieved 9 January 2012. ^ Elizalde, Pablo; Straw, Edd (30 March 2012). "Jaime Alguersuari signed as Pirelli's test driver alongside Lucas di Grassi". Autosport. Haymarket Publications. Retrieved 30 March 2012. ^ Shah, Kunal (21 December 2011). "Vitantonio Liuzzi Is Excited About Participating in the i1 Super Series". iSport India. Archived from the original on 19 January 2013. Retrieved 21 December 2011. ^ O'Leary, Jamie (2 February 2012). "I1 Supercar Series postponed to 2013; Liuzzi, Villeneuve, Fisichella lose drives". Autosport. Haymarket Publications. Retrieved 3 February 2012. ^ "Drivers: Vitantonio Liuzzi". HRT F1 Team. Archived from the original on 23 July 2012. Retrieved 6 March 2012. ^ Elizalde, Pablo (24 January 2012). "Jerome D'Ambrosio joins Lotus as third driver for 2012 F1 season". Autosport. Haymarket Publications. Retrieved 24 January 2012. ^ a b Strang, Simon; Beer, Matt (2 September 2012). "Belgian GP: Romain Grosjean gets one-race ban for start crash". Autosport. Haymarket Publications. Retrieved 2 September 2012. ^ Collantine, Keith (21 September 2012). "Vettel leads Hamilton in damp session at Singapore". F1 Fanatic. Keith Collantine. Retrieved 21 September 2012. Pastor Maldonado was fifth, the Williams driver one of several to explore Singapore's run-off areas during the session. Sergio Perez and Romain Grosjean were also among those to go off, but no-one managed to hit anything. ^ "FIA 2012 Formula One calendar". FIA.com. Fédération Internationale de l'Automobile. Archived from the original on 17 February 2013. Retrieved 21 February 2013. ^ Elizalde, Pablo (29 July 2011). "2012 Formula 1 season opener keeps March 18 slot despite overhaul". Autosport. Haymarket Publications. Retrieved 29 July 2011. ^ a b c Collantine, Keith (7 December 2011). "United States Grand Prix remains on unchanged 2012 F1 calendar". F1 Fanatic. Keith Collantine. Retrieved 7 December 2011. ^ "Formula One returns to the United States". Formula One Administration. 25 May 2010. Archived from the original on 26 May 2010. Retrieved 25 May 2010. ^ Noble, Jonathan (1 November 2011). "Formula 1 chiefs to discuss 2012 calendar amid concerns over some races". Autosport. Haymarket Publications. Retrieved 1 November 2011. ^ Elizalde, Pablo (30 November 2011). "Bernie Ecclestone gives Austin organisers a new deadline to sort contracts". Autosport. Haymarket Publications. Retrieved 1 December 2011. ^ Parkes, Ian (16 November 2011). "US Grand Prix on verge of being axed claims Bernie Ecclestone". The Independent. UK: Independent Print. Retrieved 17 November 2011. ^ Maher, John (7 December 2011). "F1 boss confirms deal with Austin organizers has been reached". The Statesman. India. Archived from the original on 7 January 2012. Retrieved 8 December 2011. ^ "City Council endorses F1, agrees to environmental deal". American Statesman. 29 June 2011. Archived from the original on 2 July 2011. Retrieved 30 June 2011. ^ Maher, John (10 November 2012). "Against all odds, F1 track has been built, ready to host race". Austin-American Statesman. Retrieved 12 November 2012. ^ Noble, Jonathan; Tremayne, Sam (8 August 2011). "Turkey hopeful of 2012 GP reprieve". Autosport. Haymarket Publications. Retrieved 1 November 2011. ^ "Exhausts to be raised for 2012". gpupdate.net. 14 July 2011. Retrieved 14 July 2011. ^ Straw, Edd (15 November 2011). "Williams tests 2012-spec top-exit exhaust system in Abu Dhabi". Autosport. Haymarket Publications. Retrieved 18 November 2011. ^ Straw, Edd (17 November 2011). "Mercedes tries 2012-style exhaust in Abu Dhabi young driver test". Autosport. Haymarket Publications. Retrieved 18 November 2011. ^ Allen, James (20 October 2011). "Radical changes to engine maps for 2012 give power back to designers". James Allen on F1. James Allen. Retrieved 1 November 2011. ^ Noble, Jonathan (11 November 2011). "No off-throttle blowing allowed in 2012 as teams block bid to allow the practice". Autosport. Haymarket Publications. Retrieved 12 November 2011. ^ "Mercedes triggered latest FIA clampdown –report". Motorsport.com. 27 February 2012. Retrieved 2 March 2012. ^ Benson, Andrew (22 July 2012). "German GP: Red Bull cleared of illegal engine mapping". BBC F1. BBC. Retrieved 24 July 2012. ^ Benson, Andrew (23 July 2012). "F1 seeks computer rule change on Red Bull". BBC F1. BBC. Retrieved 24 July 2012. ^ a b Strang, Simon (25 July 2012). "Red Bull Racing forced to alter engine mapping from Hungarian Grand Prix". Autosport. Haymarket Publications. Retrieved 26 July 2012. ^ Noble, Jonathan (21 January 2012). "Formula 1 teams have been told by the FIA that reactive ride height systems will be banned for the 2012 season". Autosport. Haymarket Publications. Retrieved 21 January 2012. ^ Noble, Jonathan (7 February 2012). "Lotus expresses disappointment at FIA's decision to ban its reactive ride system". Autosport. Haymarket Publications. Retrieved 8 February 2012. ^ Allen, James (10 January 2012). "Has Lotus Renault found this year's must-have gizmo?". James Allen on F1. James Allen. Retrieved 21 January 2012. ^ Noble, Jonathan (11 January 2012). "Lotus's rivals set to be forced to copy innovative reactive ride height system". Autosport. Haymarket Publications. Retrieved 21 January 2012. ^ Noble, Jonathan (12 January 2012). "Ferrari has developed its own reactive ride-height system for 2012 F1 car". Autosport. Haymarket Publications. Retrieved 21 January 2012. ^ Allen, James (21 January 2012). "FIA sends note to teams: Reactive suspension system is not legal". James Allen on F1. James Allen. Retrieved 21 January 2012. ^ Benson, Andrew (21 January 2012). "FIA ban new technical innovation developed by Lotus and Ferrari". BBC F1. BBC. Retrieved 21 January 2012. ^ Noble, Jonathan (23 January 2012). "Reactive ride banned because FIA believed it gave an aerodynamic benefit". Autosport. Haymarket Publications. Retrieved 24 January 2012. ^ Scarborough, Craig (27 October 2011). "2012: Nose height Regulations". ScarbsF1. WordPress. Retrieved 6 November 2011. ^ "Caterham F1 team unveils 2012 challenger". Autosport. Haymarket Publications. 25 January 2012. Retrieved 8 February 2012. ^ Collantine, Keith (21 February 2012). "Ross Brawn explains how F1's ugly noses could have been avoided". F1 Fanatic. Keith Collantine. Retrieved 22 February 2012. ^ Paterson, Cameron (21 April 2012). "Pastor Maldonado given five-place grid penalty for gearbox change". Archived from the original on 9 July 2012. Retrieved 23 May 2012. ^ a b c Elizalde, Pablo (7 December 2011). "FIA announces new sporting rules for 2012 Formula 1 season". Autosport. Haymarket Publications. Retrieved 8 December 2011. ^ Noble, Jonathan (19 December 2011). 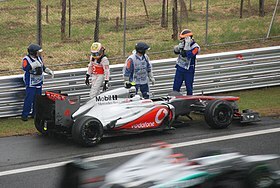 "McLaren will be ready for first 2012 Formula 1 test". Autosport. Haymarket Publications. Retrieved 19 December 2011. ^ Rencken, Dieter. "Why Geneva meeting matters for F1". Autosport.com (subscription required). Haymarket Publications. ^ Noble, Jonathan (2 November 2012). "Formula 1 teams told trick brake systems are illegal". Autosport. Haymarket Publications. Retrieved 2 November 2012. ^ Noble, Jonathan (28 August 2011). "Formula 1 teams pick Mugello for 2012's new mid-season test". Autosport. Haymarket Publications. Retrieved 31 August 2011. ^ Straw, Edd (22 December 2011). "Ferrari pushing for increase in F1 testing limit, so as not to stifle opportunities for young drivers". Autosport. Haymarket Publications. Retrieved 22 December 2011. ^ "World Motor Sport Council: 23/09/2011". Fédération Internationale de l'Automobile. 23 September 2011. Archived from the original on 27 October 2011. Retrieved 1 November 2011. ^ Noble, Jonathan (25 January 2012). "Pirelli promises more exciting races in 2012 Formula 1 season". Autosport. Haymarket Publications. Retrieved 25 January 2012. ^ Tremayne, Sam (14 November 2011). "Pirelli to trial 2012 compounds in Abu Dhabi Young Driver testing". Autosport. Haymarket Publications. Retrieved 15 November 2011. ^ Collantine, Keith (23 March 2012). "High tyre degradation makes three-stop strategies likely – 2012 Malaysian Grand Prix Friday practice analysis". F1 Fanatic. Keith Collantine. Retrieved 24 March 2012. ^ Noble, Jonathan (11 October 2011). "Renault backs Formula 1 team name change to Lotus". Autosport. Haymarket Publications. Retrieved 1 November 2011. ^ Noble, Jonathan (1 November 2011). "Virgin applies for name change to become Marussia". Autosport. Haymarket Publications. Retrieved 1 November 2011. ^ Noble, Jonathan (18 October 2011). "Ferrari: No issue with Lotus name change". Autosport. Haymarket Publications. Retrieved 1 November 2011. ^ "Mercedes unveils new gull-wing safety car". ESPN F1. ESPN. 26 February 2010. Archived from the original on 28 February 2010. Retrieved 26 February 2010. ^ "Mercedes unveils new 2015 safety and medical cars". Racer. Haymarket Publications. 6 March 2015. Archived from the original on 4 April 2015. Retrieved 2 April 2015. ^ Collantine, Keith (7 December 2011). "Lapped cars allowed to pass safety car again in 2012". F1 Fanatic. Keith Collantine. Retrieved 7 December 2011. ^ a b Collantine, Keith (7 December 2011). "Four-hour time limit among new 2012 rules". F1 Fanatic. Keith Collantine. Retrieved 8 December 2011. ^ Noble, Jonathan (9 July 2012). "FIA to disable use of DRS under yellow flag situations during F1 races". Autosport. Haymarket Publications. Retrieved 10 July 2012. ^ Elizalde, Pablo; Noble, Jonathan (24 June 2012). "Michael Schumacher keeps Valencia podium as stewards decide against penalty for yellow-flag DRS use". Autosport. Haymarket Publications. Retrieved 10 July 2012. ^ Strang, Simon; Noble, Jonathan (29 July 2011). "Bernie Ecclestone says Sky pay-to-view TV deal will grow F1's audience". Autosport. Haymarket Publications. Retrieved 31 July 2011. ^ Noble, Jonathan (30 July 2011). "Formula 1 teams accept there is no going back on Sky deal". Autosport. Haymarket Publications. Retrieved 31 July 2011. ^ Noble, Jonathan (2 September 2011). "BBC to face questioning from MPs over switch to shared F1 coverage". Autosport. Haymarket Publications. Retrieved 2 September 2011. ^ Collantine, Keith (2 December 2011). "Ferrari confirms departure from FOTA". F1 Fanatic. Keith Collantine. Retrieved 8 December 2011. ^ Cooper, Adam (2 December 2011). "Red Bull out of FOTA but still 'committed to cost saving'". Adam Cooper's F1 Blog. Adam Cooper. Retrieved 8 December 2011. ^ Straw, Edd; Beer, Matt (10 December 2011). "Christian Horner insists Red Bull Racing still committed to cost controls despite FOTA exit". Autosport. Haymarket Publications. Retrieved 11 December 2011. ^ "Sauber also confirms FOTA exit, Scuderia Toro Rosso could follow". Autosport. Haymarket Publications. 7 December 2011. Retrieved 8 December 2011. ^ Noble, Jonathan; Tremayne, Sam (22 February 2012). "Ross Brawn says F1's competitors could end up regretting that four teams quit FOTA". Autosport. Haymarket Publications. Retrieved 22 February 2012. ^ Noble, Jonathan (5 March 2012). "Red Bull downplays reliability worries despite troubled last day of F1 testing". Autosport. Haymarket Publications. Retrieved 17 March 2012. ^ Straw, Edd (21 February 2012). "Analysis: mounting issue to blame for Lotus's chassis problems?". Autosport. Haymarket Publications. Retrieved 17 March 2012. ^ Elizalde, Pablo (9 February 2012). "New HRT car now set for final F1 test after failing two crash tests". Autosport. Haymarket Publications. Retrieved 17 March 2012. ^ Collantine, Keith (27 February 2012). "Marussia to miss last pre-season test after crash test failure". F1 Fanatic. Keith Collantine. Retrieved 17 March 2012. ^ Tremayne, David (26 May 2012). "Why is this season so tight at the top?". The Independent. London: Independent Print Limited. Retrieved 27 May 2012. ^ Beer, Matt (18 March 2012). "Jenson Button storms to Australian Grand Prix victory". Autosport. Haymarket Publications. Retrieved 18 March 2012. ^ Noble, Jonathan (18 March 2012). "Jenson Button was 'more than marginal' on fuel during the Australian Grand Prix". Autosport. Haymarket Publications. Retrieved 23 March 2012. ^ Tremayne, Sam (18 March 2012). "Maldonado says he had accepted finishing behind Alonso before crash". Autosport. Haymarket Publications. Retrieved 18 March 2012. ^ Beer, Matt (18 March 2012). "Massa and Senna agree that no blame can be apportioned for late collision". Autosport. Haymarket Publications. Retrieved 18 March 2012. ^ "@adamcooperf1: 17 March". Twitter. 17 March 2012. Retrieved 23 March 2012. ^ Elizalde, Pablo; Lostia, Michele (2 May 2012). "Alonso convinced Ferrari an almost perfect team despite struggling to regularly fight for victory". Autosport. Haymarket Publications. Retrieved 3 May 2012. ^ "Malaysian Grand Prix qualifying results". BBC Sport. 24 March 2012. Retrieved 19 April 2012. ^ Noble, Jonathan (25 March 2012). "Poor weather halts Malaysian GP". Autosport. Haymarket Publications. Retrieved 25 March 2012. ^ "2012 Malaysian Grand Prix tyre strategies and pit stops". Collantine, Keith. F1 Fanatic. 25 March 2012. Retrieved 19 October 2012. ^ Elizalde, Pablo (25 March 2012). "Sergio Perez says victory was possible after finishing career-best second at Malaysian Grand Prix". Autosport. Haymarket Publications. Retrieved 25 March 2012. ^ Beer, Matt (25 March 2012). "Fernando Alonso holds off Perez to win sensational Malaysian Grand Prix". Autosport. Haymarket Publications. Retrieved 25 March 2012. ^ Collantine, Keith (25 March 2012). "Was Sauber's radio message to Perez a team order to help Ferrari?". F1 Fanatic. Keith Collantine. Retrieved 26 March 2012. ^ Noble, Jonathan; Straw, Edd (27 March 2012). "Senna says run to sixth in Malaysia eases pressure on himself and Williams". Autosport. Haymarket Publications. Retrieved 31 March 2012. ^ "2012 FORMULA 1 PETRONAS MALAYSIA GRAND PRIX Results". Formula One. 25 March 2012. Archived from the original on 26 March 2012. Retrieved 26 March 2012. ^ "Lotus files protest against Mercedes's rear wing". Autosport. Haymarket Publications. 12 April 2012. Retrieved 13 April 2012. ^ Elizalde, Pablo (12 April 2012). "Lotus protest against Mercedes wing rejected by FIA". Autosport. Haymarket Publications. Retrieved 13 April 2012. ^ Beer, Matt (14 April 2012). "Nico Rosberg flies to maiden F1 pole in the Chinese Grand Prix". Autosport. Haymarket Publications. Retrieved 15 April 2012. ^ Elizalde, Pablo (12 April 2012). "Lewis Hamilton hit by grid penalty in the Chinese Grand Prix". Autosport. Haymarket Publications. Retrieved 15 April 2012. ^ Strang, Simon; Noble, Jonathan (15 April 2012). "Jenson Button reckons McLaren's slow final pitstop cost him shot at beating Nico Rosberg's Mercedes to Chinese Grand Prix victory". Autosport. Haymarket Publications. Retrieved 15 April 2012. ^ Beer, Matt (15 April 2012). "Nico Rosberg takes commanding maiden F1 win in the Chinese Grand Prix". Autosport. Haymarket Publications. Retrieved 15 April 2012. ^ Elizalde, Pablo (15 April 2012). "Kimi Raikkonen laments Lotus tyre strategy after finishing 14th in China". Autosport. Haymarket Publications. Retrieved 16 April 2012. ^ Mackey, Robert (7 April 2012). "Bahrain Activist's Hunger Strike Belies Image of Calm Ahead of Formula One Race". The New York Times. Arthur Ochs Sulzberger, Jr. Retrieved 13 April 2012. ^ Weaver, Paul (9 April 2012). "F1 teams want FIA to postpone Bahrain Grand Prix". The Guardian. London: Guardian News and Media. Retrieved 13 April 2012. ^ "Press Release: FIA Formula One World Championship – Bahrain Grand Prix". Fédération Internationale de l'Automobile. 13 April 2012. Archived from the original on 14 April 2012. Retrieved 13 April 2012. ^ "Heavy security as Formula One arrives in Bahrain". ESPN F1. ESPN. 18 April 2012. Retrieved 18 April 2012. ^ Noble, Jonathan (7 April 2012). "Damon Hill says Formula 1 cannot afford to be 'indifferent' about Bahrain situation". Autosport. Haymarket Publications. Retrieved 18 April 2012. ^ Sukhtian, Lara (17 April 2012). "Amnesty questions Bahrain reforms as F1 concerns deepen". Google News. Google. Agence France-Presse. Archived from the original on 1 May 2012. Retrieved 18 April 2012. ^ Benson, Andrew (19 April 2012). "Bahrain Grand Prix: Force India car flees petrol bomb protest". BBC Sport. BBC. Retrieved 20 April 2012. ^ Tremayne, David; Taylor, Jerome (19 April 2012). "F1 mechanics flee Bahrain after petrol bomb attack during street protest". The Independent. London: Independent Print Limited. Retrieved 20 April 2012. ^ "Bahrain Grand Prix 2012: Force India vow to race despite petrol bomb incident". The Daily Telegraph. London: Telegraph Media Group. 19 April 2012. Retrieved 20 April 2012. ^ Beer, Matt (21 April 2012). "Sebastian Vettel secures Bahrain Grand Prix pole position". Autosport. Haymarket Publications. Retrieved 21 April 2012. ^ Collantine, Keith (22 April 2012). "2012 Bahrain Grand Prix result". F1 Fanatic. Keith Collantine. Retrieved 22 April 2012. ^ Noble, Jonathan (22 April 2012). "McLaren promises to investigate pitstop problems". Autosport. Haymarket Publications. Retrieved 22 April 2012. ^ Noble, Jonathan (22 April 2012). "Rosberg escapes penalty for incidents with Hamilton and Alonso". Autosport. Haymarket Publications. Retrieved 22 April 2012. ^ a b Collatine, Keith (22 April 2012). "2012 Bahrain Grand Prix championship points". F1 Fanatic. Keith Collantine. Retrieved 22 April 2012. ^ Taylor, Jerome; Tremayne, David (21 April 2012). "Rage against the Formula One machine". The Independent. London: Independent Print Limited. Retrieved 21 April 2012. ^ "Clashes in Bahrain ahead of F1 race". Al Jazeera. Qatar Media Group. 20 April 2012. Retrieved 21 April 2012. ^ "Protests As Anger Over Bahrain F1 Race Grows". Sky News. News Corporation. 20 April 2012. Archived from the original on 23 April 2012. Retrieved 21 April 2012. ^ Pleitgen, Frederik (18 April 2012). "Bahrain circuit boss: Race not a big risk". CNN Edition. CNN. Retrieved 21 April 2012. ^ Noble, Jonathan (30 April 2012). "Formula 1 teams gear up for first proper in-season test since 2008 at Mugello". Autosport. Haymarket Publications. Retrieved 3 May 2012. ^ a b Allen, James (3 May 2012). "Teams brand Mugello test a waste of time and money, as Alonso crashes". James Allen on F1. James Allen. Retrieved 6 May 2012. ^ Noble, Jonathan (3 May 2012). "Vitaly Petrov claims Mugello is not safe enough for Formula 1 testing". Autosport. Haymarket Publications. Retrieved 3 May 2012. ^ van Leeuwen, Andrew (3 May 2012). "Sebastian Vettel fastest for Red Bull on final morning of Mugello Formula 1 test". Autosport. Haymarket Publications. Retrieved 3 May 2012. ^ Noble, Jonathan (4 May 2012). "Red Bull boss Christian Horner calls for in-season testing rethink". Autosport. Haymarket Publications. Retrieved 5 May 2012. ^ a b Davies, Amanda (7 May 2012). "Schu on tire troubles: 'It's like driving on raw eggs'". CNN. Turner Broadcasting System. Retrieved 28 May 2012. ^ Noble, Jonathan (22 April 2012). "Pirelli responds to Michael Schumacher's criticism of its tyres". Autosport. Haymarket Publication. Retrieved 8 May 2012. ^ Noble, Jonathan; Elizalde, Pablo (10 May 2012). "Mercedes backs Michael Schumacher over his opinion on Pirelli's tyres". Autosport. Haymarket Publication. Retrieved 10 May 2012. ^ "Pirelli unhappy with old test car". GP Update. 22 August 2012. Retrieved 23 August 2012. ^ Beer, Matt (12 May 2012). "Lewis Hamilton storms to Spanish Grand Prix pole position". Autosport. Haymarket Publication. Retrieved 12 May 2012. ^ a b Noble, Jonathan (12 May 2012). "Hamilton loses Spanish GP pole position". Autosport. Haymarket Publication. Retrieved 13 May 2012. 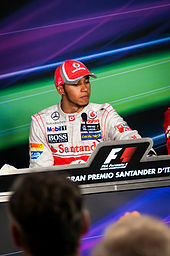 ^ "Disappointed Lewis Hamilton promises a race-day charge after his McLaren is stripped of Spanish Grand Prix pole". Autosport. Haymarket Publication. 13 May 2012. Retrieved 13 May 2012. ^ Elizalde, Pablo; Noble, Jonathan (13 May 2012). "Fernando Alonso frustrated with Charles Pic after Spanish Grand Prix blocking incident". Autosport. Haymarket Publication. Retrieved 14 May 2012. ^ Collantine, Keith (13 May 2012). "2012 Spanish Grand Prix result". F1 Fanatic. Keith Collantine. Retrieved 13 May 2012. ^ Collantine, Keith (14 May 2012). "Williams end second-longest F1 victory drought". F1 Fanatic. Keith Collantine. Retrieved 14 May 2012. ^ Beer, Matt; van Leeuwen, Andrew (13 May 2012). "Red Bull duo Mark Webber and Sebastian Vettel baffled by front wing changes". Autosport. Haymarket Publications. Retrieved 14 May 2012. ^ Collantine, Keith (13 May 2012). "2012 Spanish Grand Prix championship points". F1 Fanatic. Keith Collantine. Retrieved 13 May 2012. ^ a b Elizalde, Pablo (13 May 2012). "Michael Schumacher handed Monaco Grand Prix grid penalty". Autosport. Haymarket Publications. Retrieved 26 May 2012. ^ Noble, Jonathan (27 May 2012). "Red Bull Racing embroiled in technical row ahead of Monaco Grand Prix". Autosport. Haymarket Publications. Retrieved 27 May 2012. ^ Collantine, Keith (26 May 2012). "2012 Monaco Grand Prix grid". F1 Fanatic. Keith Collantine. Retrieved 26 May 2012. ^ Collantine, Keith (27 May 2012). "Webber gives Red Bull third straight Monaco win – 2012 Monaco Grand Prix review". F1 Fanatic. Keith Collantine. Retrieved 27 May 2012. ^ Elizalde, Pablo (27 May 2012). "Jean-Eric Vergne says tyre wear not weather gamble prompted costly late Monaco Grand Prix pitstop". Autosport. Haymarket Publications. Retrieved 28 May 2012. ^ Beer, Matt (27 May 2012). "Mark Webber becomes sixth winner in six races after charging to Monaco GP victory". Autosport. Haymarket Publications. Retrieved 27 May 2012. ^ Noble, Jonathan (27 May 2012). "No protest against Mark Webber's Monaco Grand Prix win". Autosport. Haymarket Publications. Retrieved 27 May 2012. ^ Collantine, Keith (27 May 2012). "2012 Monaco Grand Prix championship points". F1 Fanatic. Keith Collantine. Retrieved 27 May 2012. ^ Strang, Simon (26 May 2012). "Nico Rosberg tops final Monaco Grand Prix practice". Autosport. Haymarket Publications. Retrieved 26 May 2012. ^ Collantine, Keith (26 May 2012). "Maldonado handed ten-place grid penalty for Perez collision". F1 Fanatic. Keith Collantine. Retrieved 26 May 2012. ^ Noble, Jonathan (26 May 2012). "Maldonado set to get gearbox-change penalty for the Monaco Grand Prix". Autosport. Haymarket Publications. Retrieved 26 May 2012. ^ Collantine, Keith (7 June 2012). "Webber refutes 'illegal car' claims". F1 Fanatic. Keith Collantine. Retrieved 8 June 2012. ^ a b Beer, Matt (10 June 2012). "Hamilton becomes seventh winner in seven races in the Canadian Grand Prix". Autosport. Haymarket Publications. Retrieved 11 June 2012. ^ a b "Red Bull forced to change floor design as FIA clarifies regulation over holes". Autosport. Haymarket Publications. 2 June 2012. Retrieved 2 June 2012. ^ Allen, James (2 June 2012). "Red Bull allowed to keep Bahrain and Monaco wins but forced to modify car". James Allen on F1. James Allen. Retrieved 3 June 2012. ^ Benson, Andrew (9 June 2012). "The FIA force Red Bull to change axle hole design feature". BBC Sport. BBC. Retrieved 10 June 2012. ^ Collantine, Keith (9 June 2012). "Vettel leads all the way in Canadian GP qualifying". F1 Fanatic. Keith Collantine. Retrieved 10 June 2012. ^ Elizalde, Pablo (10 June 2012). "Fernando Alonso defends Ferrari's Canadian Grand Prix strategy". Autosport. Haymarket Publications. Retrieved 11 June 2012. ^ Strang, Simon (10 June 2012). "Sebastian Vettel says late pitstop in the Canadian Grand Prix was the right call". Autosport. Haymarket Publications. Retrieved 11 June 2012. ^ Collantine, Keith (10 June 2012). "2012 Canadian Grand Prix championship points". F1 Fanatic. Keith Collantine. Retrieved 11 June 2012. ^ Noble, Jonathan; Strang, Simon (10 June 2012). "Grosjean unaware he was fighting for a podium after finishing second in Canada". Autosport. Haymarket Publications. Retrieved 11 June 2012. ^ Noble, Jonathan; Beer, Matt (10 June 2012). "Perez says he had no expectations of finishing on the podium in Canadian GP". Autosport. Haymarket Publications. Retrieved 11 June 2012. ^ Mallett, Tom (10 June 2012). "Jenson Button 'lost and confused' by complete lack of pace". Autosport. Haymarket Publications. Retrieved 11 June 2012. ^ Elizalde, Pablo (10 June 2012). "Mercedes apologises to Michael Schumacher for latest technical failure". Autosport. Haymarket Publications. Retrieved 11 June 2012. ^ Beer, Matt (24 June 2012). "Alonso becomes first double winner in 2012 with superb European GP victory". Autosport. Haymarket Publications. Retrieved 24 June 2012. ^ Beer, Matt (23 June 2012). "Sebastian Vettel flies to European Grand Prix pole position". Autosport. Haymarket Publications. Retrieved 24 June 2012. ^ Strang, Simon (24 June 2012). "Sebastian Vettel convinced he could have won the European Grand Prix". Autosport. Haymarket Publications. Retrieved 24 June 2012. ^ Elizalde, Pablo (24 June 2012). "Romain Grosjean certain he could have passed Fernando Alonso for European Grand Prix victory". Autosport. Haymarket Publications. Retrieved 24 June 2012. ^ Elizalde, Pablo (24 June 2012). "Pastor Maldonado penalised for collision with Lewis Hamilton in European Grand Prix". Autosport. Haymarket Publications. Retrieved 24 June 2012. ^ Collantine, Keith (24 June 2012). "2012 European Grand Prix championship points". F1 Fanatic. Keith Collantine. Retrieved 24 June 2012. ^ Beer, Matt (6 July 2012). "Romain Grosjean tops very wet first practice for the British Grand Prix". Autosport. Haymarket Publications. Retrieved 6 July 2012. ^ "Month's rain in two days expected". MSN UK. Microsoft. Press Association. 5 July 2012. Archived from the original on 8 July 2012. Retrieved 7 July 2012. ^ Beer, Matt (7 July 2012). "Alonso grabs pole in disrupted qualifying for the British Grand Prix". Autosport. Haymarket Publications. Retrieved 8 July 2012. ^ Beer, Matt (8 July 2012). "Grosjean philosophical about first-lap accident during the British Grand Prix". Autosport. Haymarket Publications. Retrieved 8 July 2012. ^ Noble, Jonathan; Tremayne, Sam (8 July 2012). "Angry Perez tells FIA to act on Maldonado after British Grand Prix accident". Autosport. Haymarket Publications. Retrieved 8 July 2012. ^ Elizalde, Pablo (8 July 2012). "Kobayashi fined 25,000 Euro for his incident in the pits during the British Grand Prix". Autosport. Haymarket Publications. Retrieved 9 July 2012. ^ Beer, Matt (8 July 2012). "Mark Webber charges to superb British Grand Prix victory". Autosport. Haymarket Publications. Retrieved 8 July 2012. ^ Collantine, Keith (8 July 2012). "2012 British Grand Prix championship points". F1 Fanatic. Keith Collantine. Retrieved 8 July 2012. ^ a b Freeman, Glenn (22 July 2012). "Red Bull's engine maps referred to German Grand Prix stewards by FIA". Autosport. Haymarket Publications. Retrieved 22 July 2012. ^ Noble, Jonathan (28 July 2012). "Red Bull boss Christian Horner denies team has made illegal parc ferme changes". Autosport. Haymarket Publications. Retrieved 29 July 2012. ^ Strang, Simon; Noble, Jonathan (3 October 2012). "McLaren downplays potential FIA flexi wing clampdown". Autosport. Haymarket Publications. Retrieved 4 October 2012. A report in respected German magazine Auto Motor Und Sport said that the FIA was set to investigate the designs of both the McLaren and Red Bull cars amid suggestions they were cleverly getting the front wings to rotate at high speed. ^ Beer, Matt (22 July 2012). "Fernando Alonso holds off Vettel and Button to take third win of 2012 in the German GP". Autosport. Haymarket Publications. Retrieved 22 July 2012. ^ "Vettel and Horner slam Hamilton". Sky Sports F1. British Sky Broadcasting. 22 July 2012. Archived from the original on 24 July 2012. Retrieved 23 July 2012. ^ Straw, Edd (22 July 2012). "Red Bull cleared to race in German Grand Prix, as stewards declare no further action to be taken". Autosport. Haymarket Publications. Retrieved 22 July 2012. ^ Collatine, Keith (22 July 2012). "Vettel demoted to fifth with 20-second penalty". F1 Fanatic. Keith Collantine. Retrieved 23 July 2012. ^ Collantine, Keith (22 July 2012). "2012 German Grand Prix championship points". F1 Fanatic. Keith Collantine. Retrieved 22 July 2012. ^ Elizalde, Pablo (28 July 2012). "Alonso rules out podium fight if Hungarian Grand Prix takes place in dry". Autosport. Haymarket Publications. Retrieved 29 July 2012. ^ Collantine, Keith (28 July 2012). "Hamilton dominates Hungarian Grand Prix qualifying". F1 Fanatic. Keith Collantine. Retrieved 29 July 2012. ^ Tremayne, Sam; Noble, Jonathan (29 July 2012). "Michael Schumacher caused aborted start when he stopped out of position". Autosport. Haymarket Publications. Retrieved 30 July 2012. ^ Beer, Matt (29 July 2012). "Schumacher says he turned engine off in misunderstanding over delayed start". Autosport. Haymarket Publications. Retrieved 30 July 2012. ^ Noble, Jonathan; Tremayne, Sam (29 July 2012). "Romain Grosjean plays down wheel-banging clash with Lotus team-mate Kimi Raikkonen in Hungarian Grand Prix". Autosport. Haymarket Publications. Retrieved 30 July 2012. ^ Beer, Matt (29 July 2012). "Hamilton holds off Raikkonen to win the Hungarian Grand Prix". Autosport. Haymarket Publications. Retrieved 30 July 2012. ^ Collantine, Keith (29 July 2012). "2012 Hungarian Grand Prix championship points". F1 Fanatic. Keith Collantine. Retrieved 30 July 2012. ^ Allen, James (11 September 2012). "Hamilton set to move to Mercedes". James Allen on F1. James Allen. Retrieved 15 September 2012. ^ Weaver, Paul (14 September 2012). "Lewis Hamilton's future at McLaren could be decided within days". The Guardian. London: Guardian Media Group. Retrieved 15 September 2012. ^ Collantine, Keith (1 September 2012). "Button and Kobayashi share front row at Spa". F1 Fanatic. Keith Collantine. Retrieved 2 September 2012. ^ Collantine, Keith (3 September 2012). "Grosjean is first banned driver since Schumacher". F1 Fanatic. Keith Collantine. Retrieved 3 September 2012. ^ Collantine, Keith (2 September 2012). "Double penalty for Maldonado after jump start and crash". F1 Fanatic. Keith Collantine. Retrieved 2 September 2012. ^ Straw, Edd (2 September 2012). "Belgian GP: Loose HRT wheel caused Narain Karthikeyan's Spa crash". Autosport. Haymarket Publications. Retrieved 2 September 2012. ^ Collantine, Keith (2 September 2012). "Button storms to Spa win after first-lap shunt". F1 Fanatic. Keith Collantine. Retrieved 2 September 2012. ^ Collantine, Keith (2 September 2012). "2012 Belgian Grand Prix championship points". F1 Fanatic. Keith Collantine. Retrieved 2 September 2012. ^ Noble, Jonathan; Beet, Matt (2 September 2012). "Belgian GP: Caterham fined, Webber and Schumacher escape penalties, for pit incidents". Autosport. Haymarket Publications. Retrieved 2 September 2012. ^ Strang, Simon (2 September 2012). "Belgian GP: Romain Grosjean accepts being banned for Spa start crash". Autosport. Haymarket Publications. Retrieved 2 September 2012. ^ "Alonso: Fault cost me 'easiest pole'". Sky Sports F1. BSkyB. 8 September 2012. Archived from the original on 12 September 2012. Retrieved 9 September 2012. ^ Collantine, Keith (8 September 2012). "2012 Italian Grand Prix grid". F1 Fanatic. Keith Collantine. Retrieved 8 September 2012. ^ Cooper, Adam (10 September 2012). "Stefano Domenicali: "We were totally black with no telemetry"". Adam Cooper's F1 Blog. Adam Cooper. Retrieved 12 September 2012. ^ "Hamilton: I was always in control". Sky Sports F1. BSkyB. 9 September 2012. Archived from the original on 12 September 2012. Retrieved 9 September 2012. ^ Collantine, Keith (9 September 2012). "Hamilton wins as Perez charges to second". F1 Fanatic. Retrieved 10 September 2012. ^ "Hamilton: 'I was always in control'". Sky Sports F1. BSkyB. 9 September 2012. Archived from the original on 11 September 2012. Retrieved 9 September 2012. ^ "Senna slams di Resta for pushing him off the track". ESPN F1. ESPN. 9 September 2012. Retrieved 11 September 2012. ^ Collantine, Keith (9 September 2012). "2012 Italian Grand Prix result". F1 Fanatic. Keith Collantine. Retrieved 9 September 2012. ^ Collantine, Keith (9 September 2012). "2012 Italian Grand Prix championship points". F1 Fanatic. Retrieved 10 September 2012. ^ Collantine, Keith (22 September 2012). "Hamilton on pole as Maldonado shines in Singapore". F1 Fanatic. Keith Collantine. Retrieved 23 September 2012. ^ "Hamilton "cruising" before retirement". Autosport. Haymarket Publications. 23 September 2012. Retrieved 24 September 2012. ^ "Schumacher gets penalty for crash". Autosport. Haymarket Publications. 23 September 2012. Retrieved 23 September 2012. ^ "Vettel wins as Hamilton retires". Autosport. Haymarket Publications. 23 September 2012. Retrieved 23 September 2012. ^ "Alonso: Third place little comfort". Autosport. Haymarket Publications. 23 September 2012. Retrieved 23 September 2012. ^ Collantine, Keith (26 September 2012). "Williams positive despite 'extremely frustrating' race". F1 Fanatic. Keith Collantine. Retrieved 26 September 2012. Senna suffered burn marks on his back, which did not require treatment, during the race. As he retired the team warned him "the car is unsafe" and advised him to "jump out of the car, it could be a KERS problem". However Williams confirmed to F1 Fanatic that the KERS was not responsible for Senna's burns. ^ Collantine, Keith (23 September 2012). "2012 Singapore Grand Prix championship points". F1 Fanatic. Keith Collantine. Retrieved 23 September 2012. ^ a b Strang, Simon (7 October 2012). "Japanese GP: Webber slams 'first-lap nutcase' Grosjean". Autosport. Haymarket Publications. Retrieved 7 October 2012. ^ Noble, Jonathan (7 October 2012). "Japanese GP: Lotus must 'control' Romain Grosjean says Red Bull boss". Autosport. Haymarket Publications. Retrieved 8 October 2012. ^ "Massa: Podium could secure future". Autosport. Haymarket Publications. 7 October 2012. Retrieved 7 October 2012. ^ Noble, Jonathan; Beer, Matt (7 October 2012). "Japanese GP: Kamui Kobayashi celebrates 'amazing' podium". Autosport. Haymarket Publications. Retrieved 7 October 2012. ^ Collantine, Keith (7 October 2012). "2012 Japanese Grand Prix result". F1 Fanatic. Keith Collantine. Retrieved 7 October 2012. ^ "Vettel cruises to Japanese GP victory". Autosport. Haymarket Publications. 7 October 2012. Retrieved 7 October 2012. ^ Collantine, Keith (7 October 2012). "2012 Japanese Grand Prix championship points". F1 Fanatic. Keith Collantine. Retrieved 7 October 2012. ^ Elizalde, Pablo (7 October 2012). "Japanese GP: Alonso says five 'mini championships' left". Autosport. Haymarket Publications. Retrieved 7 October 2012. 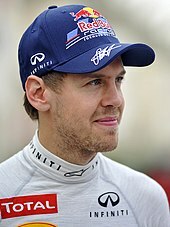 ^ "Vettel wins in Korea to take championship lead". Autosport. Haymarket Publications. 14 October 2012. Retrieved 14 October 2012. ^ a b Collantine, Keith (14 October 2012). "2012 Korean Grand Prix championship points". F1 Fanatic. Keith Collantine. Retrieved 14 October 2012. ^ Collantine, Keith (14 October 2012). "Vettel takes championship lead with hat-trick of wins – 2012 Korean Grand Prix". F1 Fanatic. Keith Collantine. Retrieved 14 October 2012. Nico Rosberg was also involved in the accident – his second first-lap misfortune in as many races – and his Mercedes came to a stop at the beginning of lap two. He managed to find somewhere to park it on the barrier-lined straight leading to turn two. Marshals continued to wave chequered flags at the scene of Rosberg's retirement, in the DRS zone, until lap nine. ^ "Webber: Race a tyre-saving exercise". Autosport. Haymarket Publications. 14 October 2012. Retrieved 14 October 2012. ^ "Vettel's Korean GP tyres had no issues". Autosport. 26 October 2012. Retrieved 28 October 2012. ^ "Vergne: Korea drive my best in F1". Autosport. Haymarket Publications. 14 October 2012. Retrieved 14 October 2012. ^ Benson, Andrew (14 October 2012). "Korean GP: Romain Grosjean to be retained by Lotus for 2013". BBC F1. BBC. Retrieved 16 October 2012. Grosjean is under no specific threat of further punishment from governing body the FIA, nor is he officially considered to be on any kind of probation. However, he was told ahead in Korea that he would probably be disqualified from the race if he had a similar incident to his latest crash, in which he simply ran into the back of Mark Webber's Red Bull in Japan a week ago. ^ "Anti-roll bar failure hindered Hamilton". Autosport. Haymarket Publications. 14 October 2012. Retrieved 15 October 2012. ^ a b "Hamilton concedes title out of reach now". Autosport. Haymarket Publications. 14 October 2012. Retrieved 14 October 2012. ^ "Ferrari all out with new components at private test". F1Technical.net. 22 October 2012. Retrieved 24 October 2012. Italian magazine Autosprint found out new parts will be brought to every single of the 4 races left in this championship, beginning with the Indian GP in 7 days time. [...] The new parts for India, as tested by Rigon on 18 October at Idiada, Spain include a different rear wing, changed brake ducts, new aerofoils under the nose cone, changed sidepod panels and different exhaust exits. ^ Collantine, Keith (26 October 2012). "Vettel leads the way as practice begins in India". F1 Fanatic. Keith Collantine. Retrieved 29 October 2012. ^ Strang, Simon (26 October 2012). "Sebastian Vettel stays on top in second practice". Autosport. Haymarket Publications. Retrieved 29 October 2012. ^ Tremayne, Sam (27 October 2012). "Sebastian Vettel and Red Bull complete practice sweep". Autosport. Haymarket Publications. Retrieved 29 October 2012. ^ Tremayne, Sam (27 October 2012). "Vettel leads all-Red Bull front row in India". Autosport. Haymarket Publications. Retrieved 29 October 2012. ^ Collantine, Keith (28 October 2012). "2012 Indian Grand Prix result". F1 Fanatic. Keith Collantine. Retrieved 28 October 2012. ^ "Webber rues 'demoralising' KERS loss". Autosport. Haymarket Publications. 28 October 2012. Retrieved 29 October 2012. ^ "Raikkonen: Saturday error cost podium". Autosport. Haymarket Publications. 28 October 2012. Retrieved 29 October 2012. ^ "Perez: India a 'total disappointment'". Autosport. Haymarket Publications. 28 October 2012. Retrieved 29 October 2012. ^ Collantine, Keith (28 October 2012). "Schumacher and Kobayashi avoid penalties". F1 Fanatic. Keith collantine. Retrieved 29 October 2012. ^ a b "Raikkonen wins for Lotus as Vettel finishes third". Autosport. Haymaket Publications. 4 November 2012. Retrieved 5 November 2012. ^ Noble, Jonathan (3 November 2012). "Abu Dhabi GP: Sebastian Vettel disqualified from qualifying". Autosport. Haymarket Publications. Retrieved 3 November 2012. ^ "Hulkenberg 'had nowhere to go'". Autosport. Haymaket Publications. 4 November 2012. Retrieved 5 November 2012. ^ "Rosberg says accident was unavoidable". Autosport. Haymaket Publications. 4 November 2012. Retrieved 5 November 2012. ^ "Hamilton: McLaren had dominant car". Autosport. Haymaket Publications. 4 November 2012. Retrieved 5 November 2012. ^ "Grosjean: 'Collisions weren't my fault'". Autosport. Haymaket Publications. 4 November 2012. Retrieved 5 November 2012. ^ "Button: Vettel's 'brave' pass unexpected". Autosport. Haymaket Publications. 4 November 2012. Retrieved 5 November 2012. ^ Collantine, Keith (4 November 2012). "2012 Abu Dhabi Grand Prix championship points". F1 Fanatic. Keith Collantine. Retrieved 5 November 2012. ^ "FIA gives COTA thumbs up!". Circuit of the Americas. 25 September 2012. Archived from the original on 27 September 2012. Retrieved 25 September 2012. ^ "Texas circuit gets FIA's green light". Autosport. Haymarket Publications. 26 September 2012. Retrieved 26 September 2012. ^ Beer, Matt (17 November 2012). "Sebastian Vettel beats Hamilton to Austin pole position". Autosport. Haymarket Publications. Retrieved 17 November 2012. ^ Straw, Edd (17 November 2012). "Romain Grosjean hit with gearbox penalty". Autosport. Haymarket Publications. Retrieved 18 November 2012. ^ "US Grand Prix: Felipe Massa grid penalty elevates Fernando Alonso". BBC Sport. bbc.co.uk/sport. 18 November 2012. Retrieved 18 November 2012. ^ "Webber: Alternator issues a concern". Autosport. Haymarket Publications. 18 November 2012. Retrieved 18 November 2012. ^ Noble, Jonathan (19 November 2012). "United States Grand Prix: Christian Horner concedes alternator problems are a worry". Autosport. Haymarket Publications. Retrieved 19 November 2012. ^ "Vettel says Karthikeyan delay costly". Autosport. Haymarket Publications. 18 November 2012. Retrieved 18 November 2012. ^ "Hamilton wins as 2012 title battle goes to wire". Autosport. Haymarket Publications. 18 November 2012. Retrieved 18 November 2012. ^ "Schumacher blames tyre problems". Autosport. Haymarket Publications. 18 November 2012. Retrieved 18 November 2012. ^ "Perez sad to end Sauber stint badly". Autosport. Haymarket Publications. 25 November 2012. Retrieved 25 November 2012. ^ "Hamilton upset with Hulkenberg". Autosport. Haymarket Publications. 25 November 2012. Retrieved 25 November 2012. ^ Tremayne, Sam; Beer, Matt (27 November 2012). "Red Bull thanks 'gracious' Schumacher for giving Vettel sixth". Autosport.com. Haymarket Publications. Retrieved 28 November 2012. ^ "Vettel is champion, Button wins thriller". Autosport. Haymarket publications. 25 November 2012. Retrieved 25 November 2012. ^ "Raikkonen: I knew where I was going". Autosport. Haymarket Publications. 25 November 2012. Retrieved 25 November 2012. ^ Collantine, Keith (4 October 2012). "Michael Schumacher announces F1 retirement". F1 Fanatic. Keith Collantine. Retrieved 25 November 2012. ^ "Marussia devastated to lose 10th". Autosport. Haymarket Publications. 25 November 2012. Retrieved 25 November 2012. ^ Николай Фоменко: "Марусе" нужно объединиться с Петровым [Nikolay Fomenko: "Marussia" should unite with Petrov]. Izvestia (in Russian). News Media. 16 December 2012. Retrieved 7 January 2013. ^ "Marussia driver Charles Pic switches to Caterham for 2013". BBC Sport. BBC Sport. 23 November 2012. Retrieved 7 January 2013. ^ "Yellow flag cloud hanging over Vettel title". SpeedCafe. 29 November 2012. Retrieved 1 December 2012. ^ "FIA: 'No case' to answer for Vettel pass". Autosport.com. Haymarket Publications. 29 November 2012. Retrieved 1 December 2012. ^ "Ferrari wants clarification on Vettel move". Autosport.com. Haymarket Publications. 29 November 2012. Retrieved 1 December 2012. ^ "Analysis: Why Vettel's pass was legal". Autosport.com. Haymarket Publications. 29 November 2012. Retrieved 1 December 2012. ^ "Formula 1: New footage proves green flag during Vettel overtake". 30 November 2012. Retrieved 1 December 2012. ^ "Ferrari considers Vettel case now closed". Autosport.com. Haymarket Publications. 30 November 2012. Retrieved 1 December 2012. ^ "Red Bull satisfied pass row is over". Autosport.com. Haymarket Publications. 30 November 2012. Retrieved 1 December 2012. ^ Collantine, Keith (12 May 2012). "Hamilton penalty hands Maldonado first pole position". F1 Fanatic. Keith Collantine. Retrieved 13 May 2012. ^ Beer, Matt (26 May 2012). "Schumacher quickest, Webber on pole for the Monaco Grand Prix". Autosport. Haymarket Publications. Retrieved 26 May 2012. 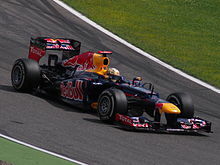 Wikimedia Commons has media related to 2012 in Formula One. This page was last edited on 11 April 2019, at 16:54 (UTC).